Got an email from Stewart Transport that increased their estimated delays from 7-10 days to 21 days. 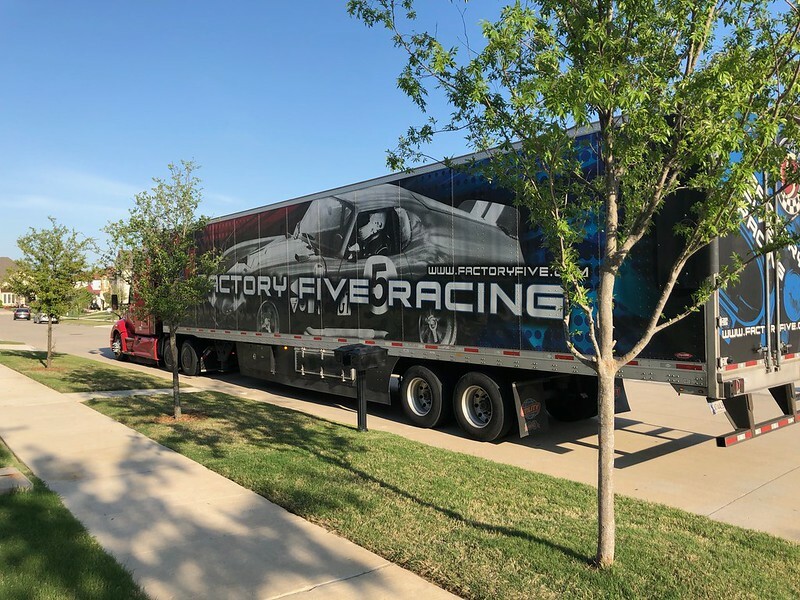 I called FFR and talked to someone in the warehouse and they said that Stewart was sending 2 trucks this week and that they are "up to" the week of my build, but they don't think my kit is going to make it onto either of those trucks - not what I wanted to hear. Here is a photo of my kit sitting in the warehouse. Poor thing looks so homesick to me. 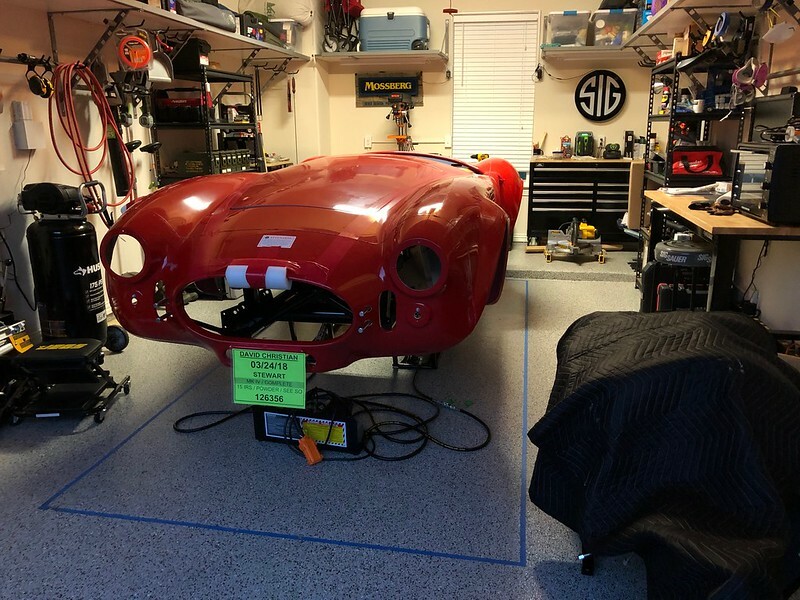 This week I received the standard glovebox I ordered from Alex's Custom Roadsters. Overall I am impressed with the quality of the glovebox and I think it will look great on my dash. I sent Alex a piece of my interior leather and he covered the door with it and did a great job. 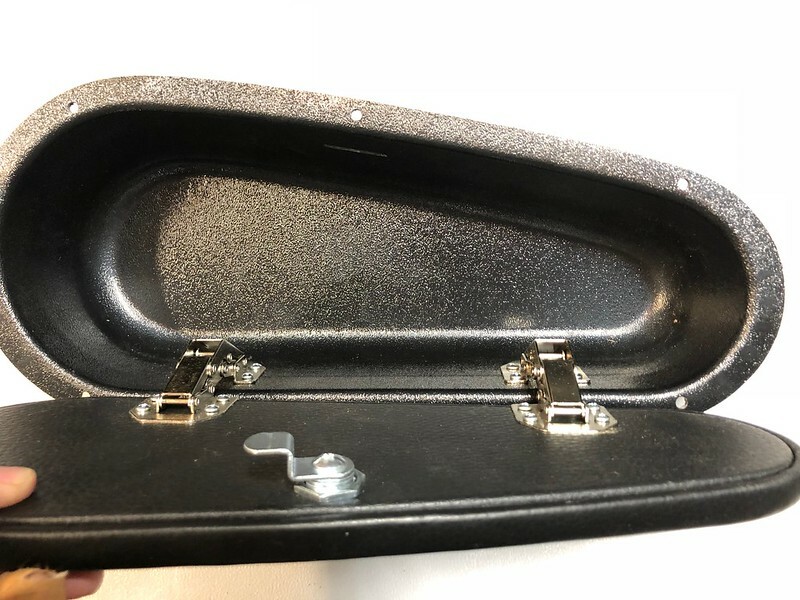 The door is heavy and solid and the latches are very substantial - it's WAY better than the cheap glovebox on Factory Five's padded dash, which will bend like a piece of thin paper if you push on one side of it. There are a couple upgrades I made to the glovebox, however. 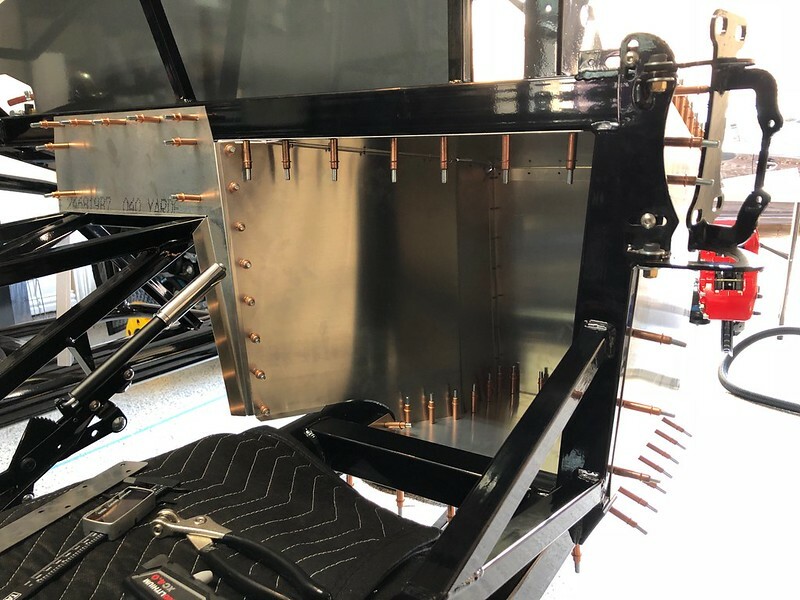 First you can see that the latch slides into a slot cut into the top of the glovebox. 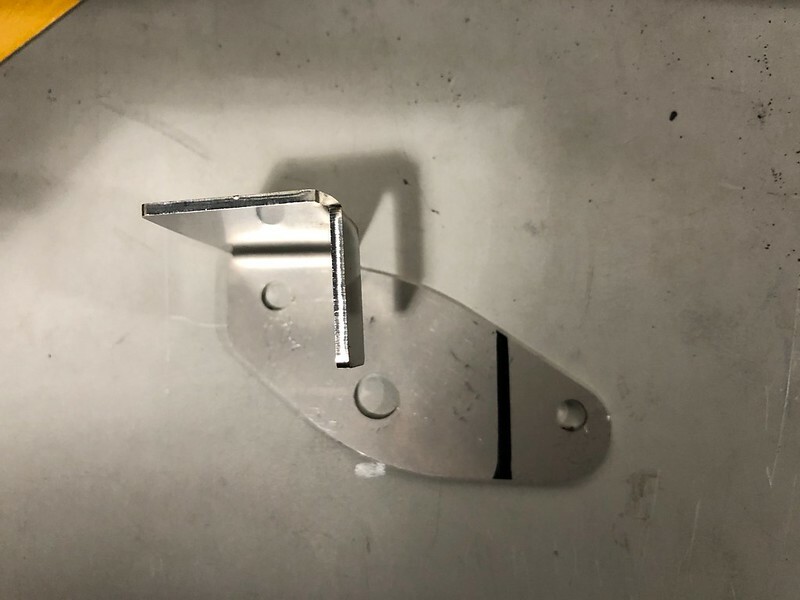 I found that depending on how much pressure you use when closing the door that the latch may not always line up with the slot so may take a bit of back and forth movement to find the right position. 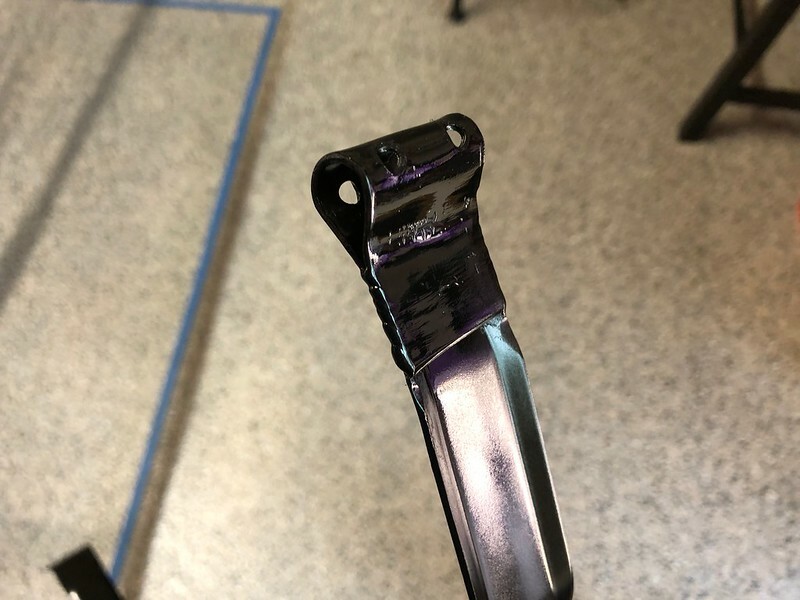 I made a back stop out of 3/4" aluminum angle for a positive stop right at the slot - gave me a chance to practice with my powder coating setup as well. I also purchased some nylon flocking fibers, acrylic paint, and a flocking tube from craftflocking.com and flocked the inside of the glovebox. I like the velvety look and feel much more than the shiny plastic. Great idea on the flocking. It's pretty simple. The kit I put together was $16 but I could probably do several more gloveboxes , I bought way more fibers than needed. One tip would be to make sure the paint is very smooth before you spray on the fibers. There are a couple areas where it doesn't look completely smooth, but not too noticeable. Didn't hear from Stewart this week either so I called FFR. Sally says it looks like it may get picked up on Monday. That's what I was told for my Truck as well. 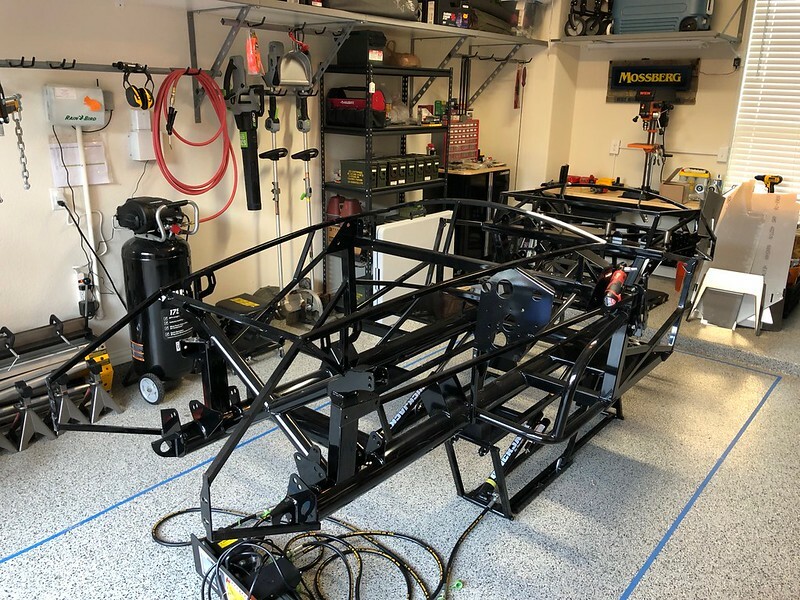 Well I finally received word from Stewart that my kit is on the truck and should be delivered to me either Monday or Tuesday. My kit has finally arrived! Woo-hoo! Let the madness begin. 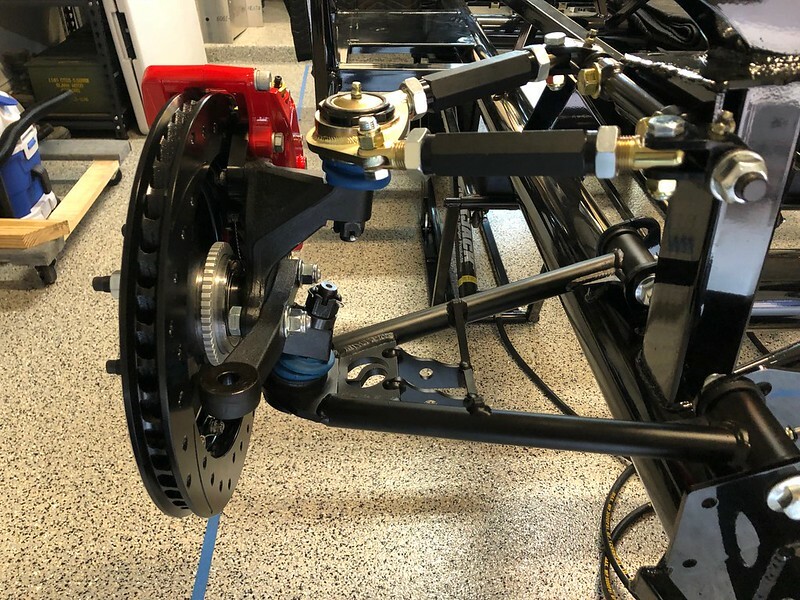 I'm waiting on control arms for the front and rear, toe arms for the rear, and all four shocks - that going to put a damper on the suspension assembly for awhile, but there is plenty to work on. 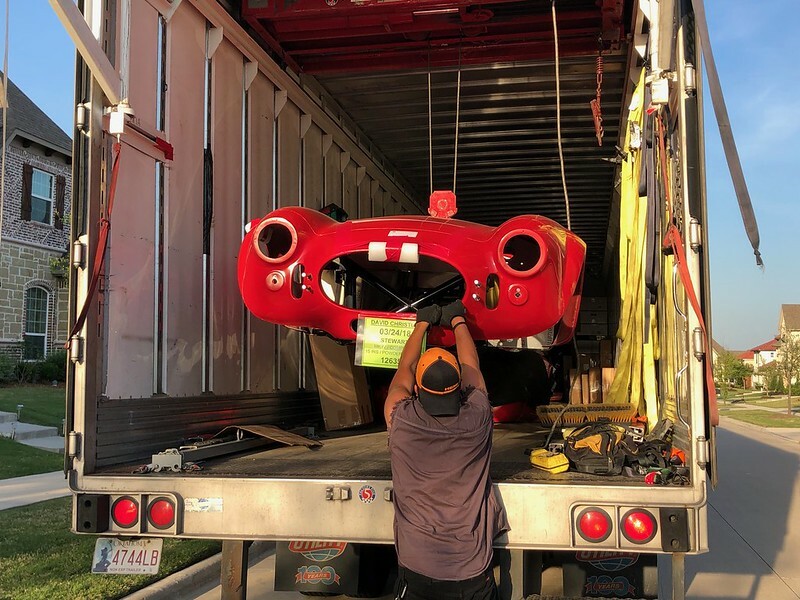 I got the body on the buck and the boxes in the garage. 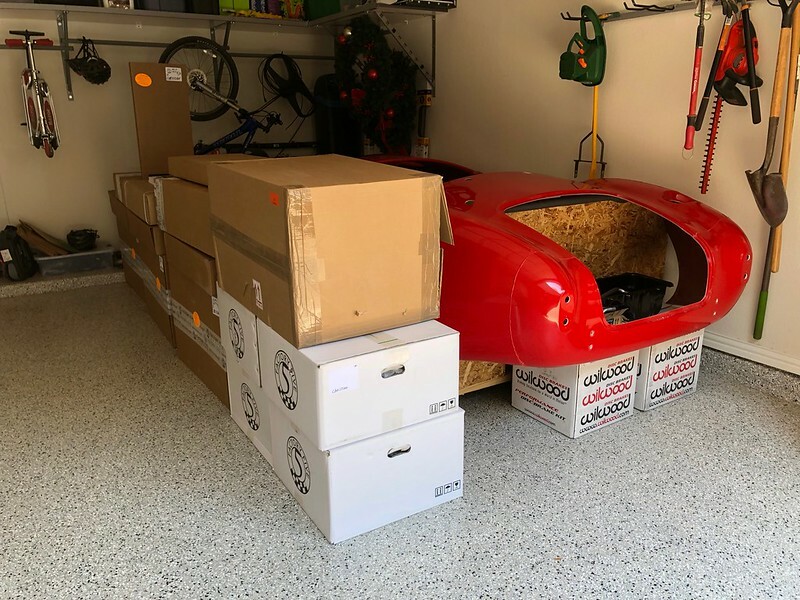 I've started inventory, that is going to take awhile. 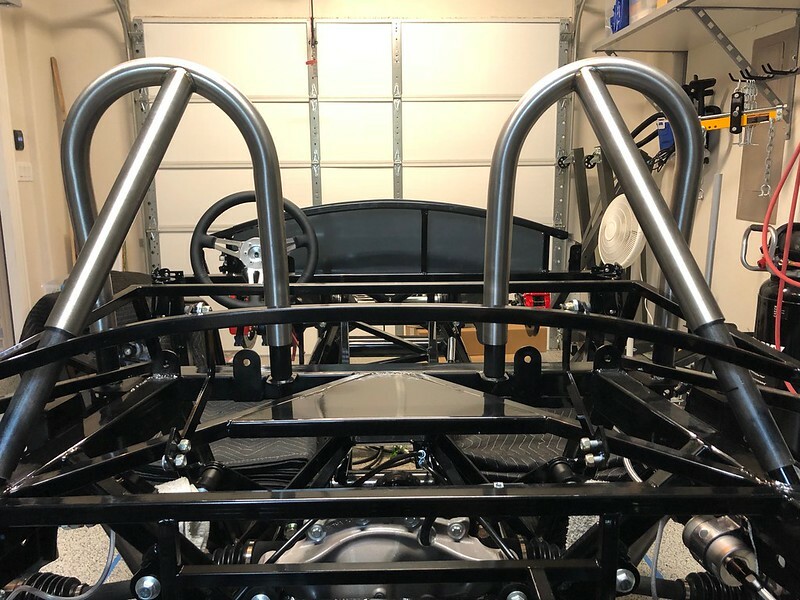 I mocked up the dual stainless breeze roll bars. I've got a welder lined up to come over and tack them and make a couple other welds for me and he wanted some pics. I don't want to see any of the brackets for the tank straps in the trunk, so I decided to cut them both off. I'll fabricate a new bracket out of 16 ga steel to weld in at the same height as the DS bracket, and modify the PS strap to fit. I got the diff painted with POR-15. 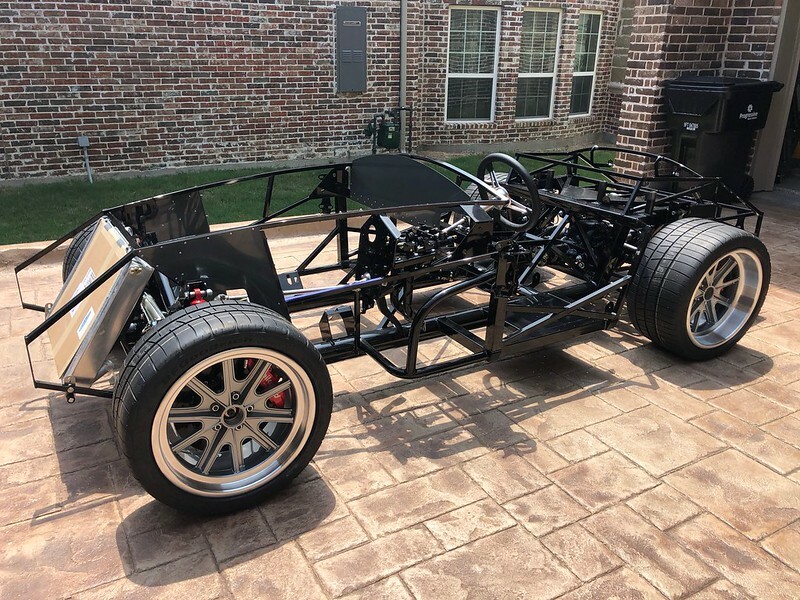 I'm also a member of the "yes I have friends, no they weren't available to help" school of roadster assembly. 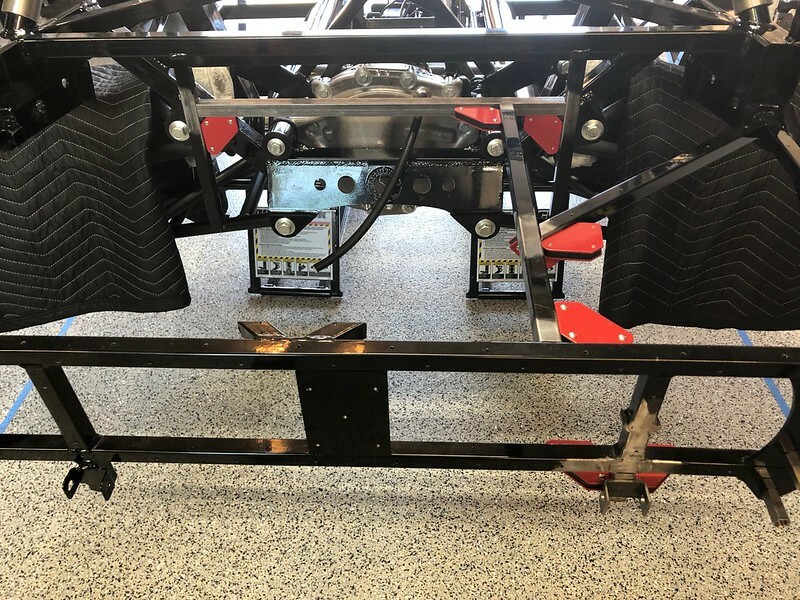 Between my floor jack with homemade trans platform, engine crane, and tie-down straps I was able to get it into place all by myself and all four of the bolts went in with little effort. Woot! 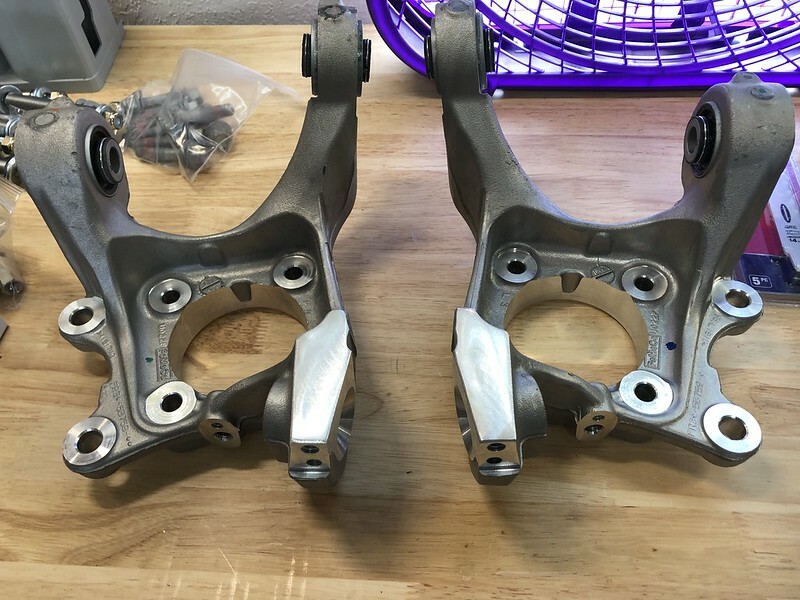 I didn't get as much time to work on my kit this weekend as I would have liked, but my back-ordered control arms did come in late Saturday and I received my dropped trunk kit from Russ Thompson. I cut the ends off of the rear spindles using my angle grinder and a cutting wheel, cleaned up with a flap disc. I had a heck of a time swapping out the wheel studs. 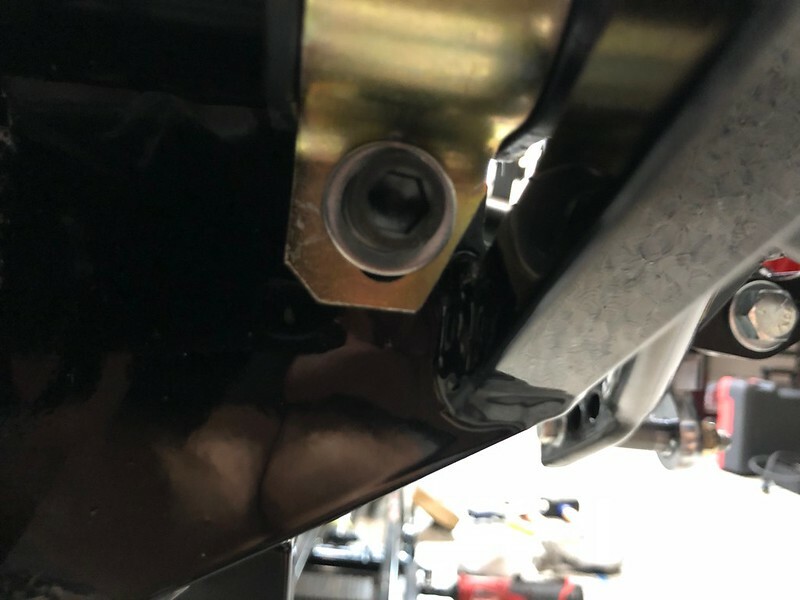 The FFR recomended method to remove the old studs (grab head of stud in vice, bang out with hammer) worked pretty well but their method to draw in the new studs with a lug nut and washer did not. I got one in with great effort, but about 1/2 way through the 2nd stud the lug nut was getting destroyed, the washers were bending up, etc... 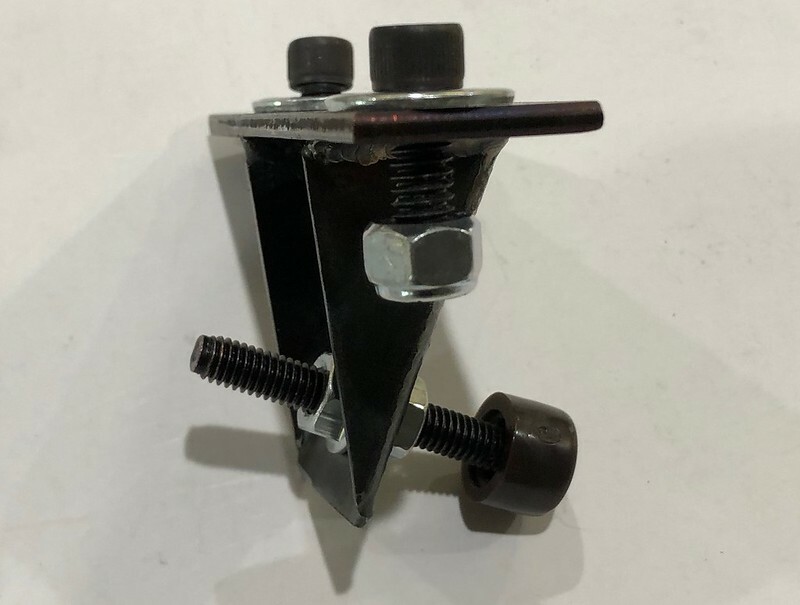 So I went to Home Depot and bought a large bolt to use as a punch, ground down the threads on one side, and used a socket in the vice and beat the studs in with a 4lb hammer. It took about a dozen blows to fully seat each stud, but I got them all in. Here are the completed spindles and hubs. You can see the socket and hammer blows marred the hubs a bit, but I guess it shouldn't cause me to lose too much sleep since they will be hidden. I also ordered up some stainless bolts and couplers from McMaster Carr for the rear Quick Jacks mod. 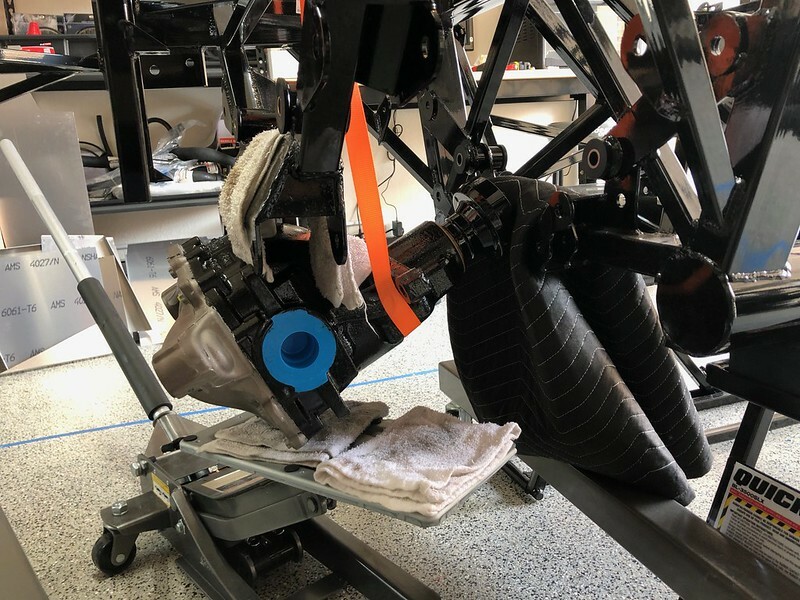 Next I started to install all the IRS control and toe arms. 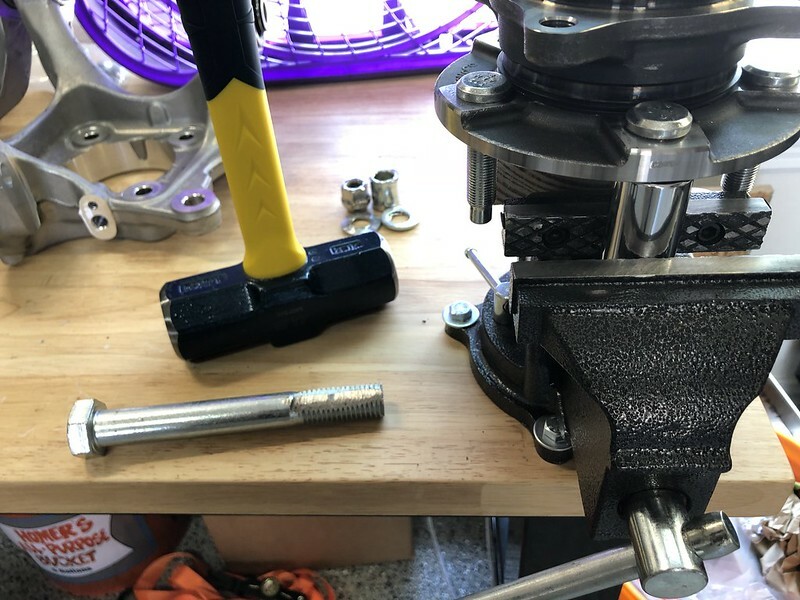 A tip I picked up at the Mott's school was to cut some thin, radial grooves in the end of the bushing with a hack saw in order to help the grease flow across the face of the bushing. I have no idea if this will make a difference, but did it anyway. It seems that it should help. 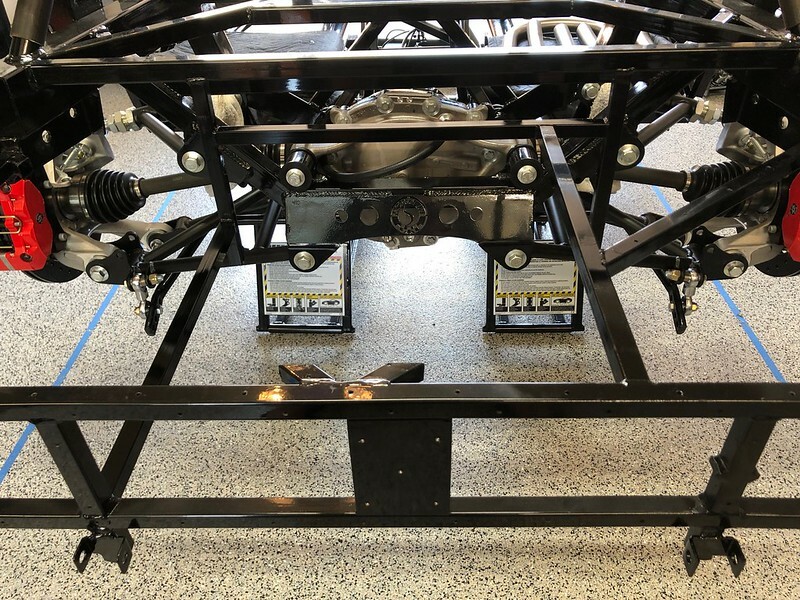 It took quite a bit of coaxing with my precision "knockometer" to get the upper and lower control arms in place, but I finally got all the bolts loosely installed. 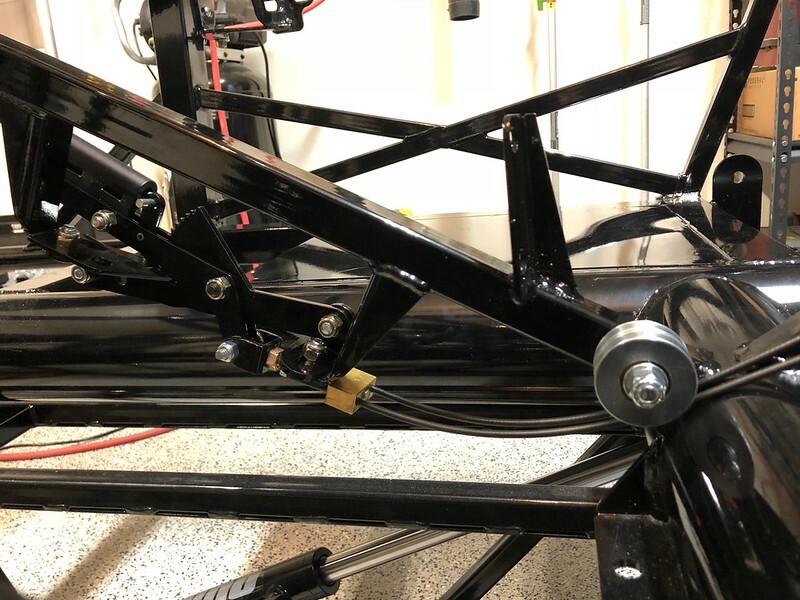 I need to paint my sway bar mounts and get those in place so a few of those bolts will have to come back out, I hope the arms don't move on me. 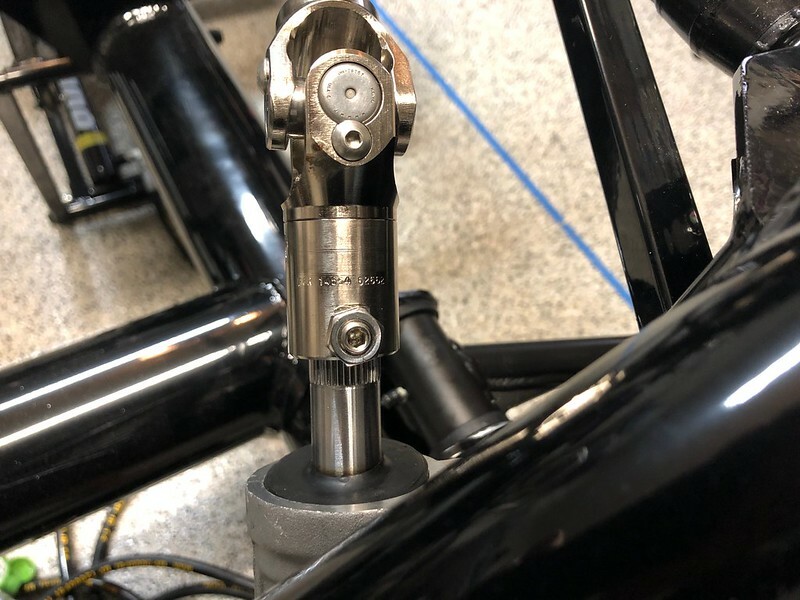 I discovered that FFR sent me 16mm bolts instead of 14mm for mounting the toe arms to the spindles, so I am going to have to wait on new bolts before I can attach the spindles. 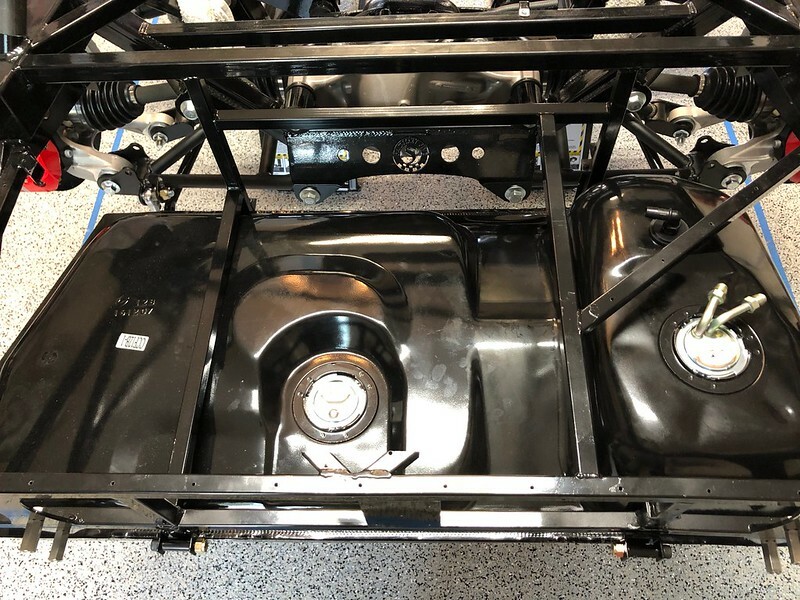 Next I started assembly of my Russ Thompson dropped trunk kit. I need just a little more tweaking of the floor cutout and then can drill out the holes to attach it to the floor. I plan on cutting the diagonals tubes and re-welding them in new locations to help support the box and rear frame. Hopefully I can get these two projects finished up soon and move onto something else. 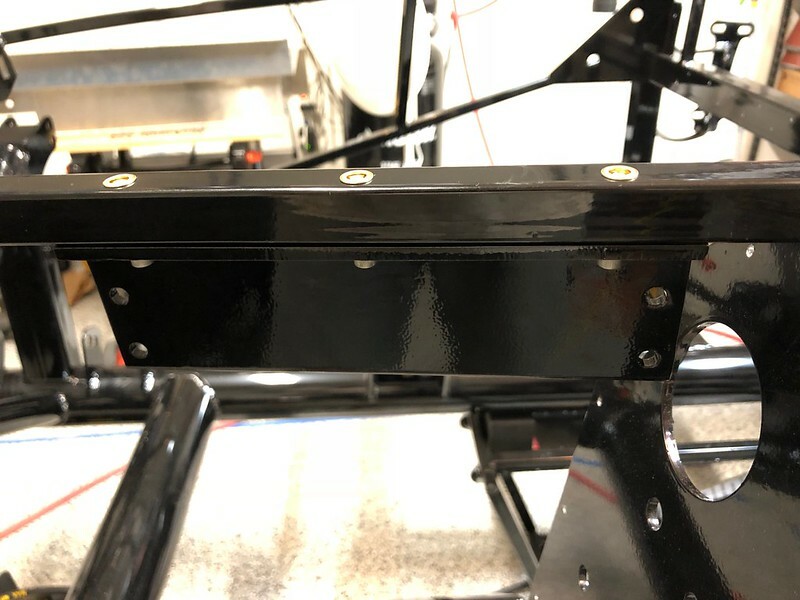 I powder coated the mounting brackets for the rear sway bar. Here they are fresh out of the oven. Didn't turn out too bad but I see a bit of "orange peel", I think I put too much powder on it, but not bad for first attempt. I mounted my rear spindles. Here you can see the bracket I made out of 1/8" aluminum to cover the ABS sensor hole. 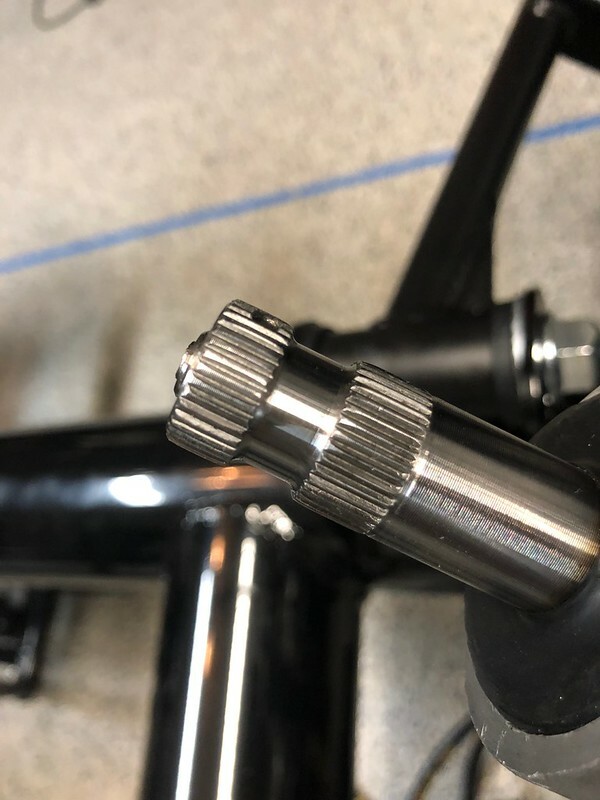 The hole for the 6mm bolt was not threaded so I had to tap it. I got the rear brakes properly shimmed and torqued. 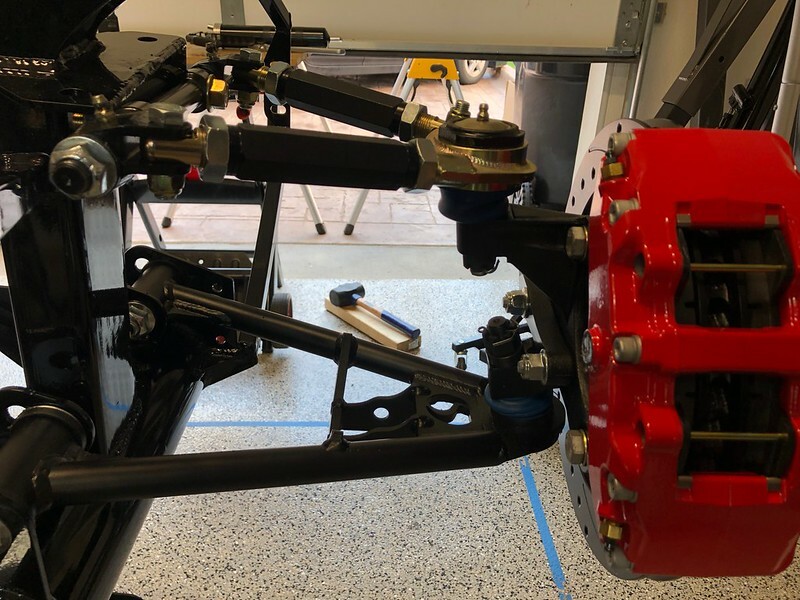 You can see that my sway bar still isn't mounted to the spindles. I took the rod ends to a local machine shop to have them cut down to size and still waiting to get them back. I didn't want to tackle that with my Dremel or sawzall. I went to Auto Zone and used their "Loan A Tool" program to get the 36mm socket to tighten the axle nut. 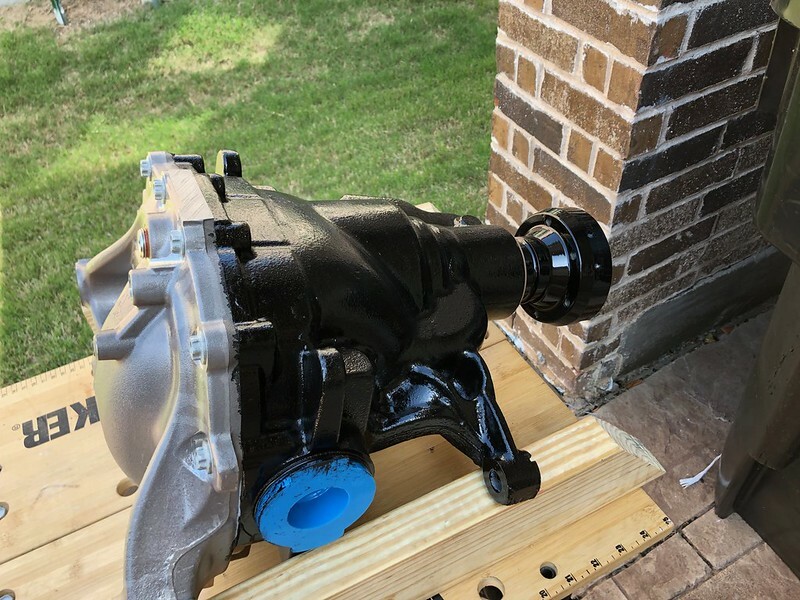 The specs in the instructions said to torque it to 98 ft lbs "+45 degree". 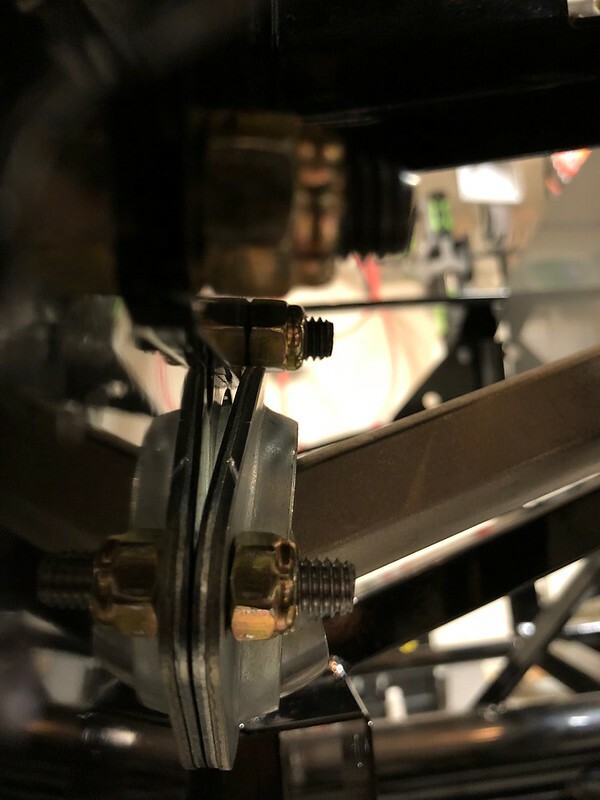 I could not get it to budge past 98 ft lbs even when using a breaker bar against the wheel studs to stop the hub from turning, so there is no "+45 degrees" for me. Did anyone else have an issue with this? Is it anything to worry about? Next I made a bracket to mount my triple reservoir. 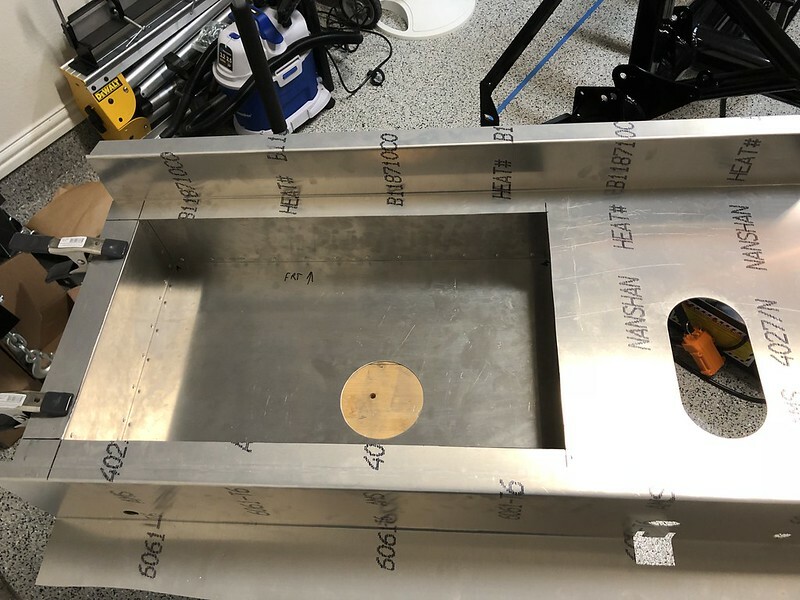 I used a piece of 2.5" angle aluminum I bought from onlinemetals.com and cut it down on the bandsaw at work. 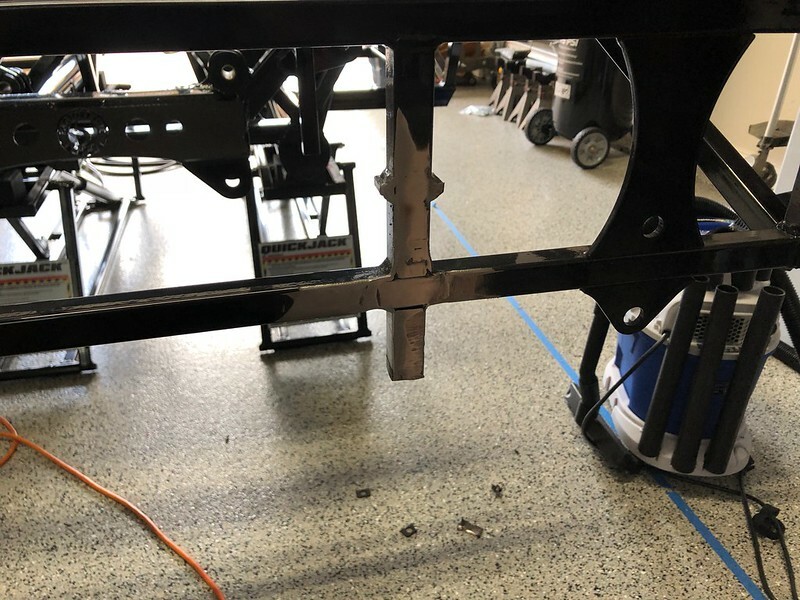 I attached it to the rail using 3 10-32 rivnuts on the top rail and fasten it with 1" socket head bolts from underneath and it is pretty flush on top. I positioned it so that the front of the reservoir is only 9.5" from the DS foot box (thanks for the specs Paul!). I went with the triple reservoirs from JAMAR. It's a bit more money than the CNC but I really like the look of it and, quite frankly, wanted to do something a little different. 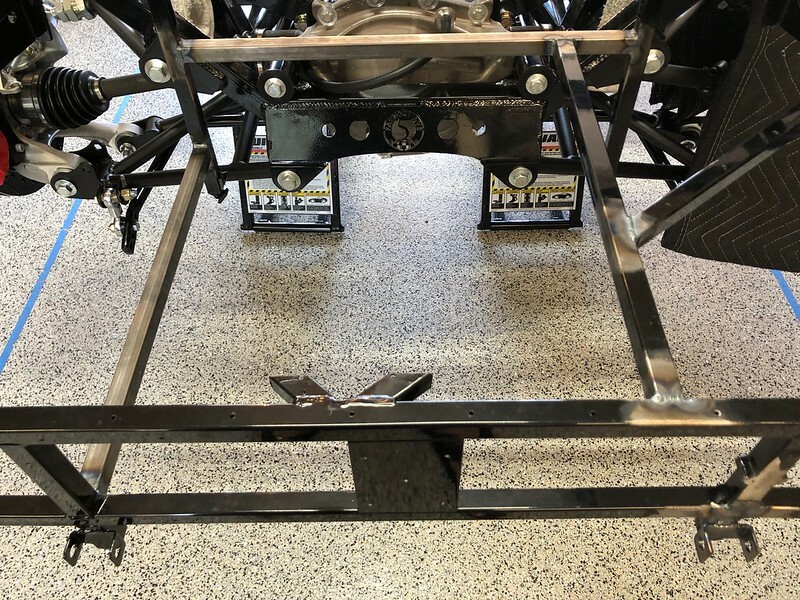 Here is a better look at the bracket and it's location after powder coating. With this long Memorial Day weekend coming up I am looking forward to getting some quality build hours in. 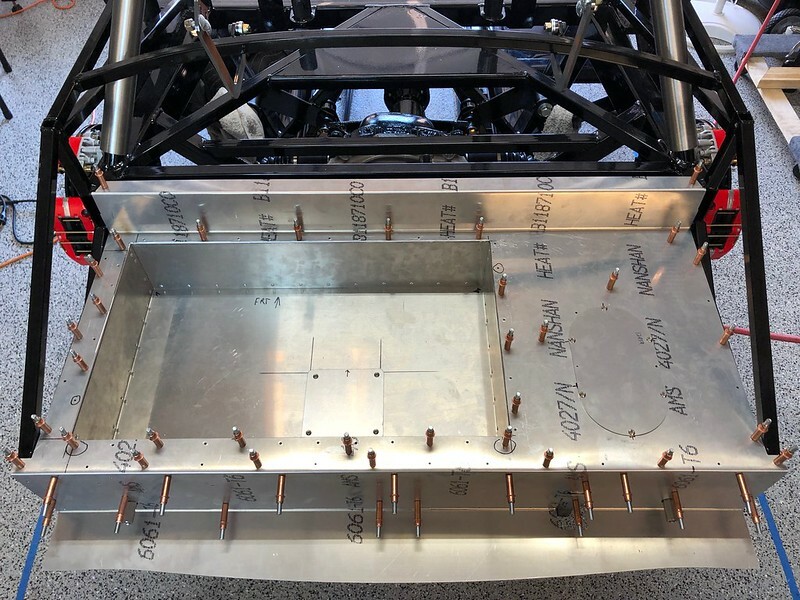 I've got most of my pre-weld fabrication complete. This is how I plan to reinforce the trunk area after cutting the diagonals. When I cut the diagonals I intentionally left the tube "stubs" so they will extend under and support the lip of the trunk box on two sides, and the new support tube on the right will provide quite a bit of rigidity as well. 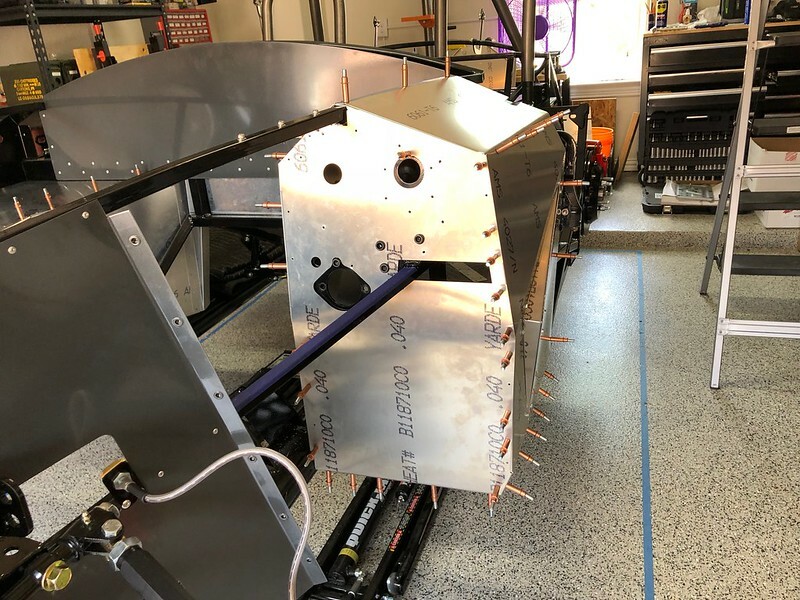 I also plan to run one more tube below the trunk box on the left but need to get the tank into place and check clearance and determine the best placement. You can also see the new tank strap bracket I fabricated out of 1" x 1/8" steel bar stock. Gotta get my welder friend out here soon, hopefully next weekend to get all these welded up. 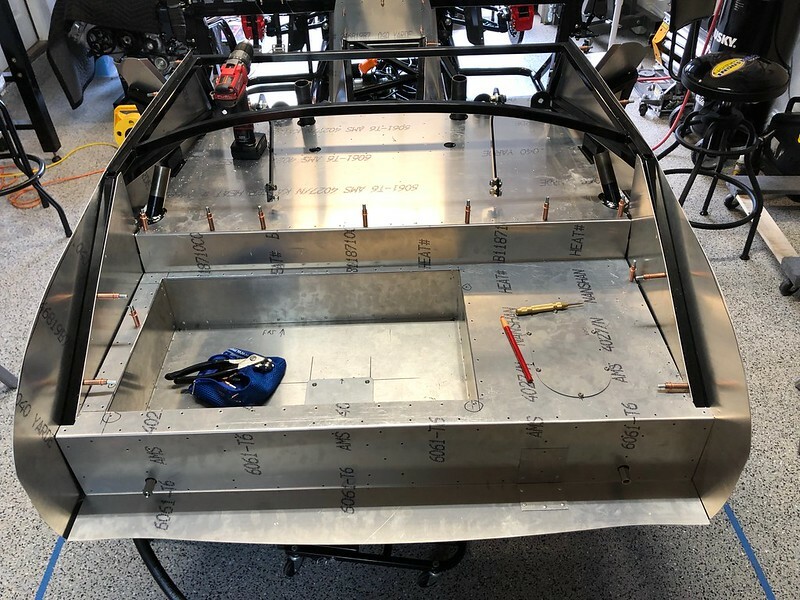 I have the trunk aluminum nearly complete - just need to fab a cover to go over the old tank strap locations. I ended up using rivnuts to make the access panels removable. I'm still waiting to get my F-Panels back from powder coat but I decided to go ahead and start on the front end. 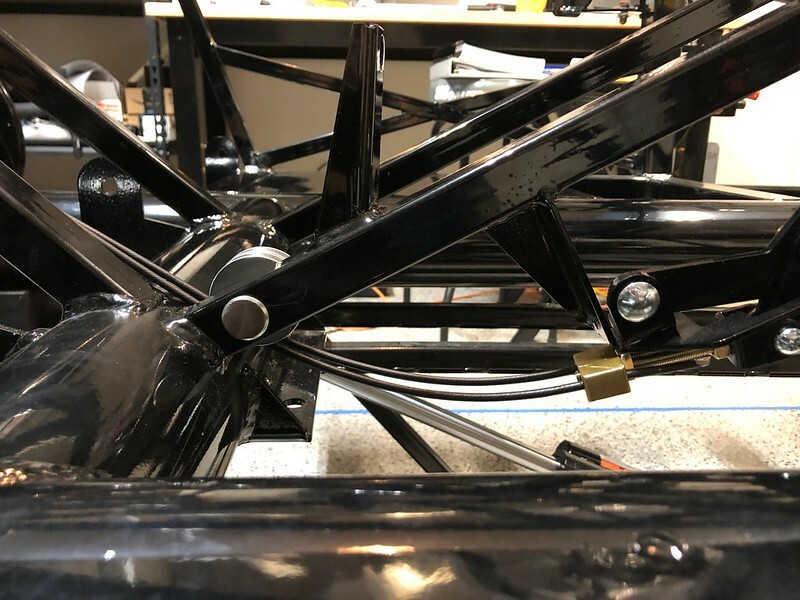 I just snugged up the bolts that mount the upper control arms to the frame and I figure I can just remove those bolts and pivot the entire assembly away from the frame in order to rivet in my F-Panels when I get them back. Both of my upper control arms were installed incorrectly so I had to unscrew and swap them around. I guess it's too much to ask whoever assembles these to take an extra 2 seconds to make sure they do it correctly I guess I was lucky on my ball joints though, both screwed all the way in to the shoulder by hand. I loc-tited those and tightened then down with a 24" adjustable wrench I got at Harbor Freight this morning for a mere $22.50 with my 25% off coupon! 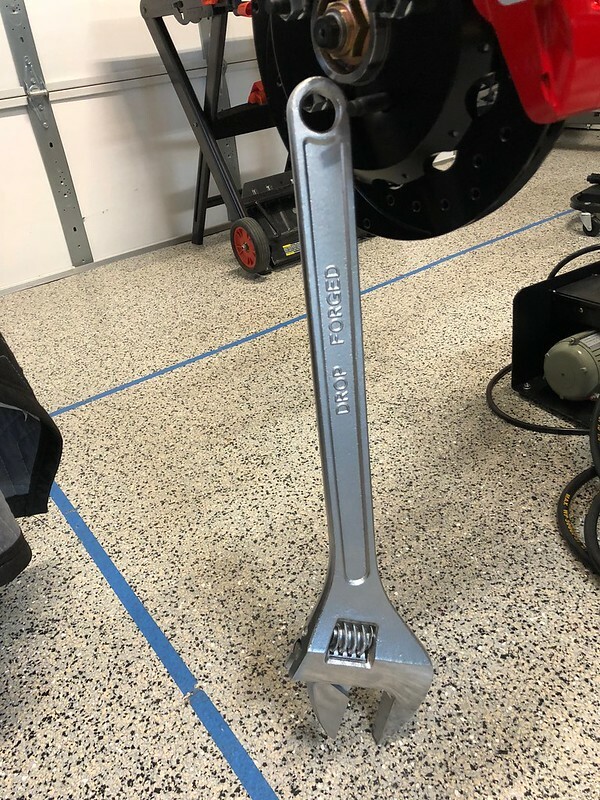 That is one big hulking wrench. I figure I can use it to crush zombie skulls during the apocalypse. I posted photos of front and rear of both sides. Let me know if anything looks out of the ordinary. 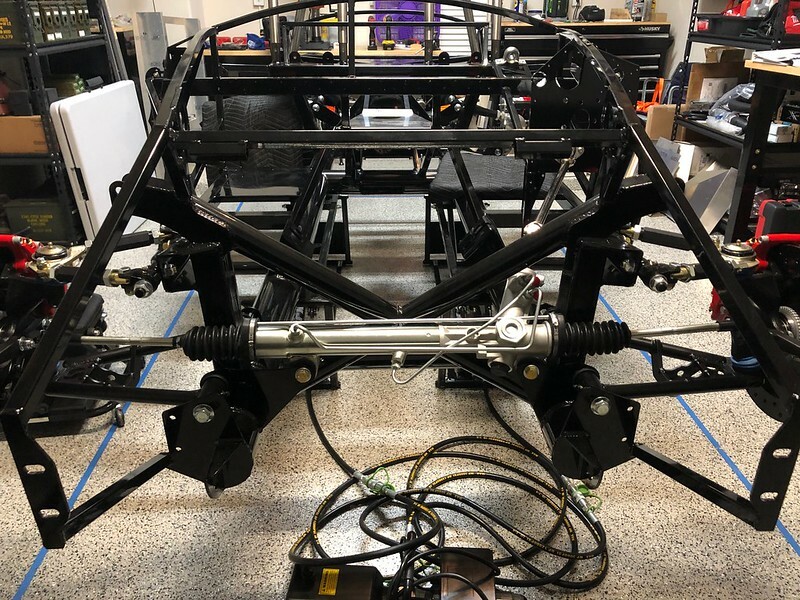 Still waiting on all four back-ordered shocks. As I was installed the second rotor I noticed a directional arrow on the rotor and it was pointing in the wrong direction! 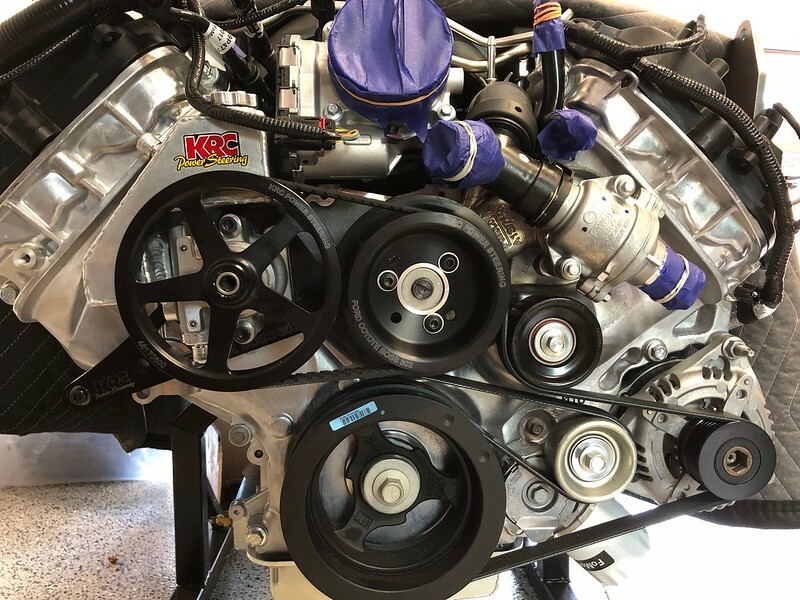 I quickly removed the calipers on the other side and swapped the rotors before the loc-tite had time to set. I then wondered if I got the rears on wrong as well. I figured I had a 50% chance of getting it right. Unlike the photos in the instructions, this input shaft does not have any flats on it. Do I just tighten the set screw down onto the lower splines or is it supposed to land in the area between the two bands of splines? This is where the shaft enters the footbox. Does this look correct? I know this has to come back out to install my front footbox aluminum, which I should be getting back from powder coat tomorrow morning. Looks like you are sandwiching the front bulkhead with the two halves of the bearing retainer; they should both be on the same side. Thanks! So both on the outside of the footbox? 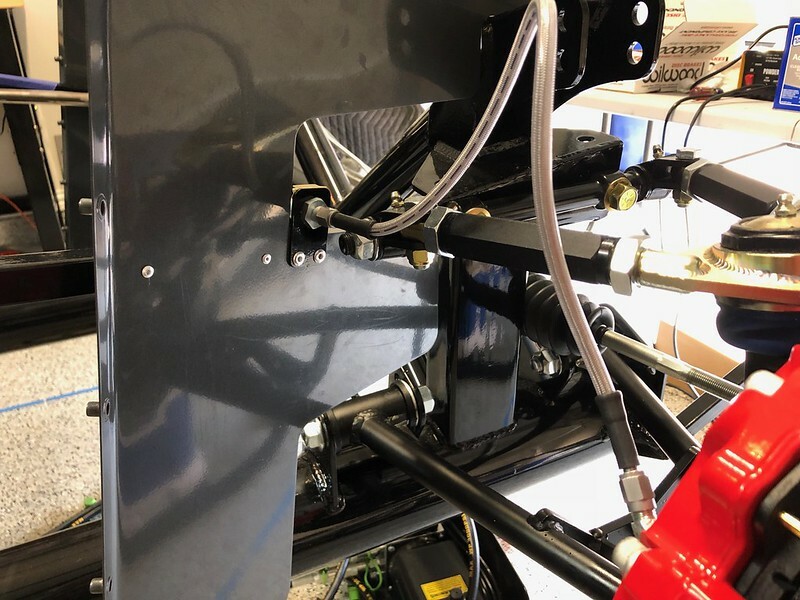 Inside or outside doesn't really matter unless you are using a vacuum brake booster. I found an awesome welder through Facebook of all places, and he lives only a mile from my house! Shout out to Matt from Warrior Welding. He came over on Friday and welded up all my new tank supports and my new PS tank strap. 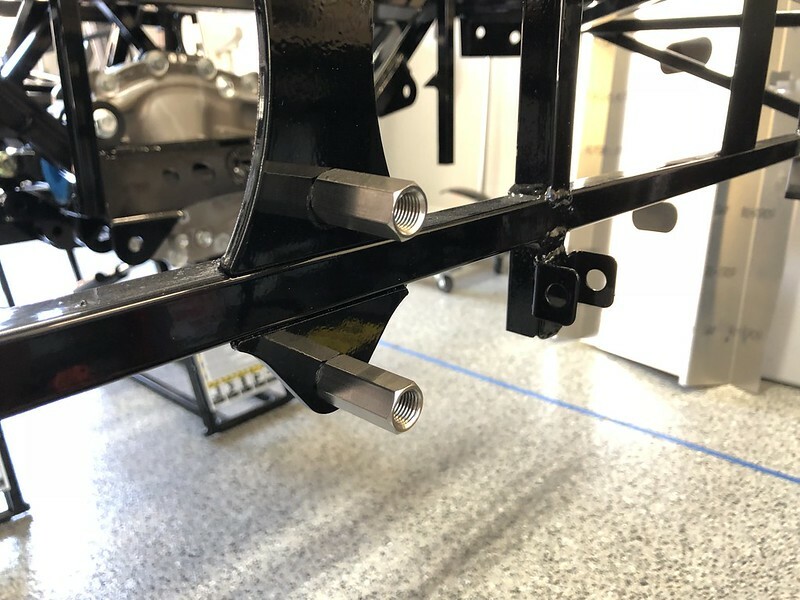 Here are the new trunk supports after welding. And this is what they look like after painting. 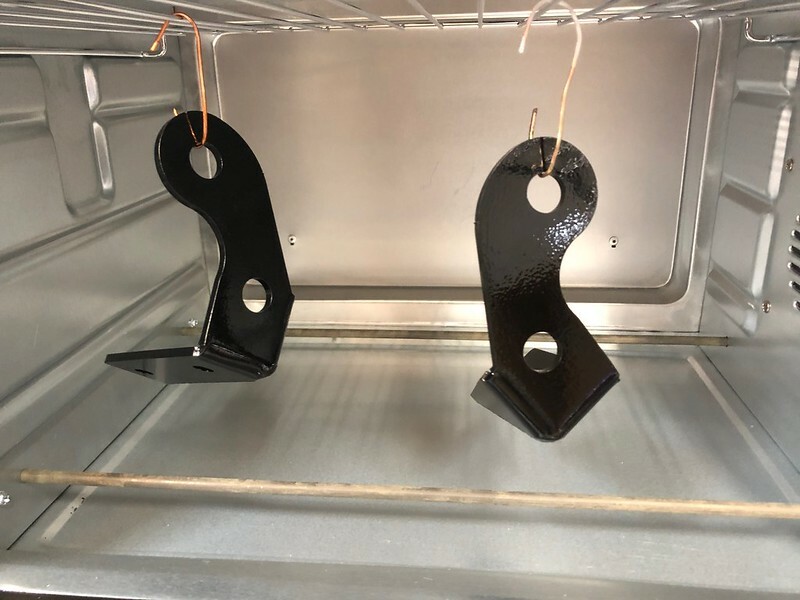 I used a gloss black appliance rattle can and it matches fairly well. Because I lowered the position of the PS tank strap bracket, I had to modify the PS tank strap. 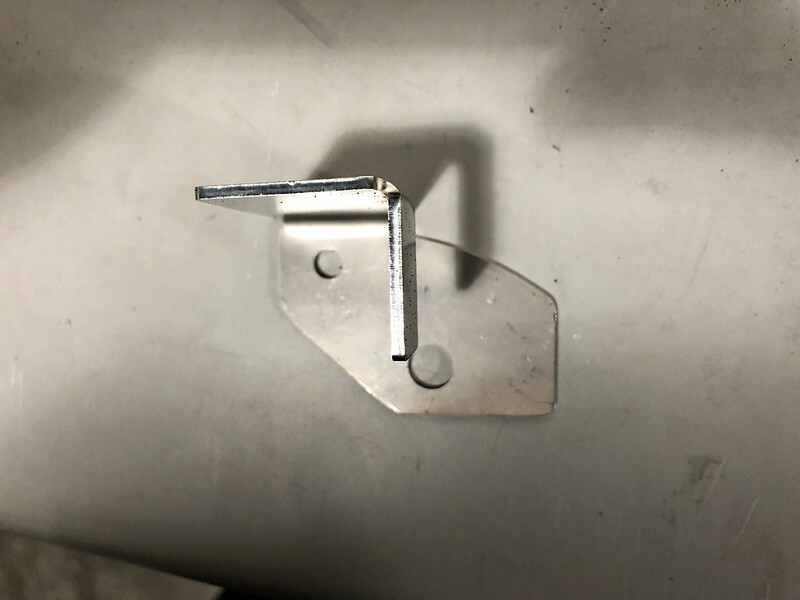 I just drilled out the spot welds on the back end, flattened it out with a hammer on my vice, and then bent it around a bolt in the vice at the appropriate position. I just kept comparing it to that end of the DS strap until it looked right. 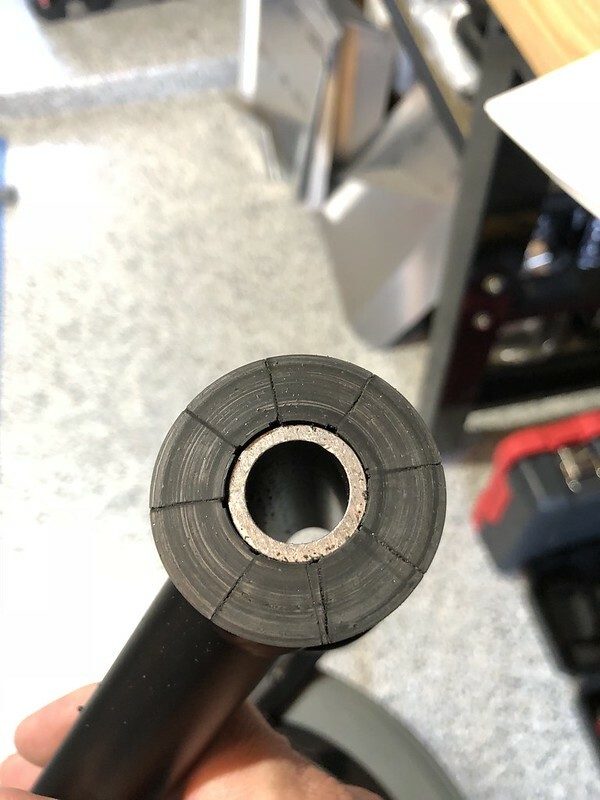 I cut off the excess on the end and had my friend weld the ends back together. Touched it up with the rattle can. 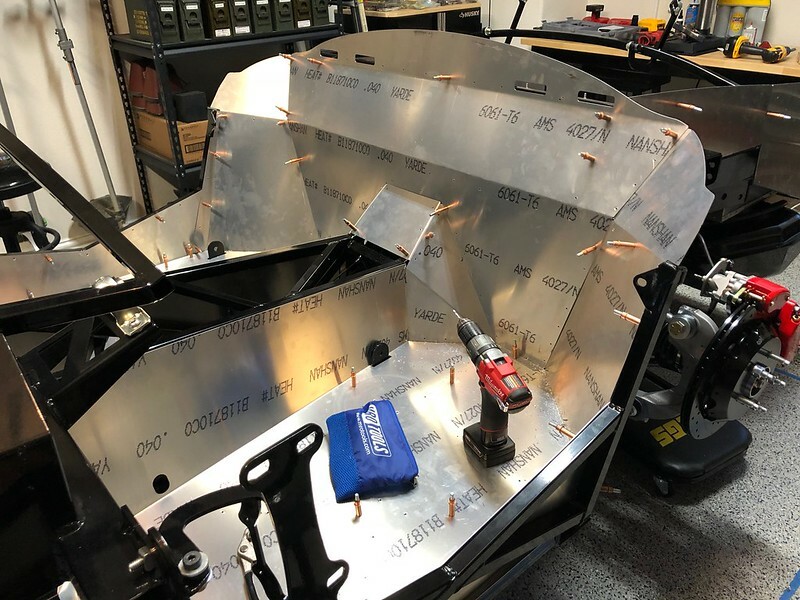 Here is a close up of the PS tank strap area after installation of the tank. Speaking of the fuel tank, I went ahead and installed that. I have an M-Pro racing hanger which was kind of a pain to install. I had to cut a small notch in the opening to allow clearance of the longer return line, but I got it in there and managed to not get any trash in the tank. And finally here is my completely fabbed trunk with drop box and block-off plate I made to cover the old tank strap cut outs. I was at Home Depot this afternoon picking up some parts to add some drip lines to my irrigation system when something caught my eye and I got an idea. 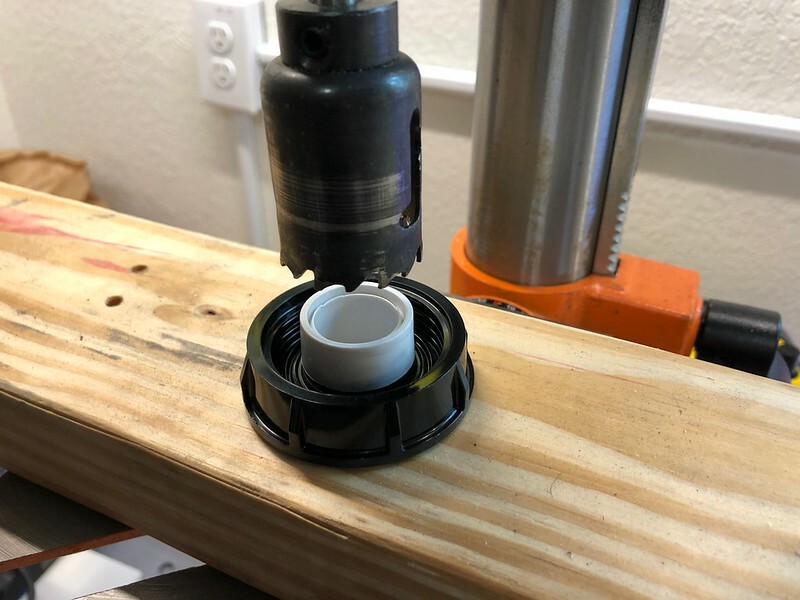 I decided I can make a decent gasoline vapor filter for the vent line using a replacement popup body. They even have a 1/2" barb fitting that is perfect for attaching to the vent line. Total investment was under $3 (excluding the filter carbon). Here are the parts I picked up. 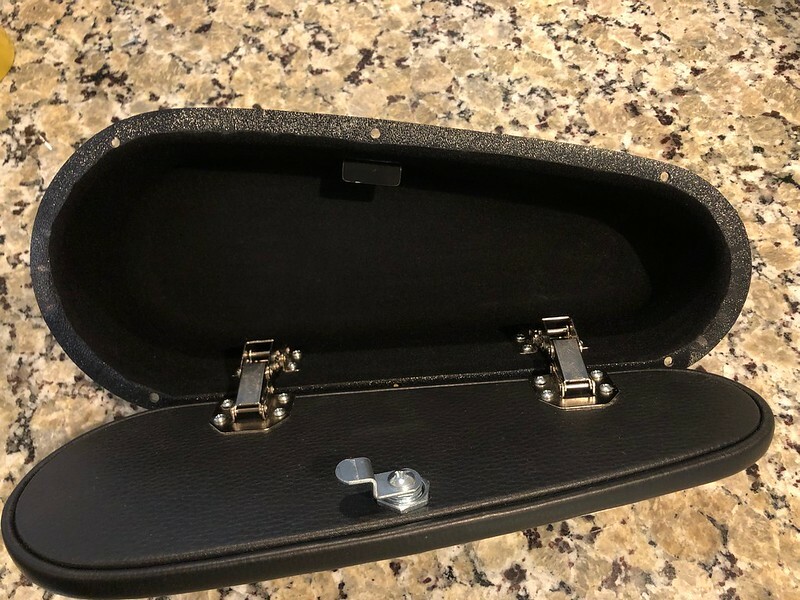 There is no popup component since it's just a replacement body, but there is a spring and an inner tube that pulls right out. 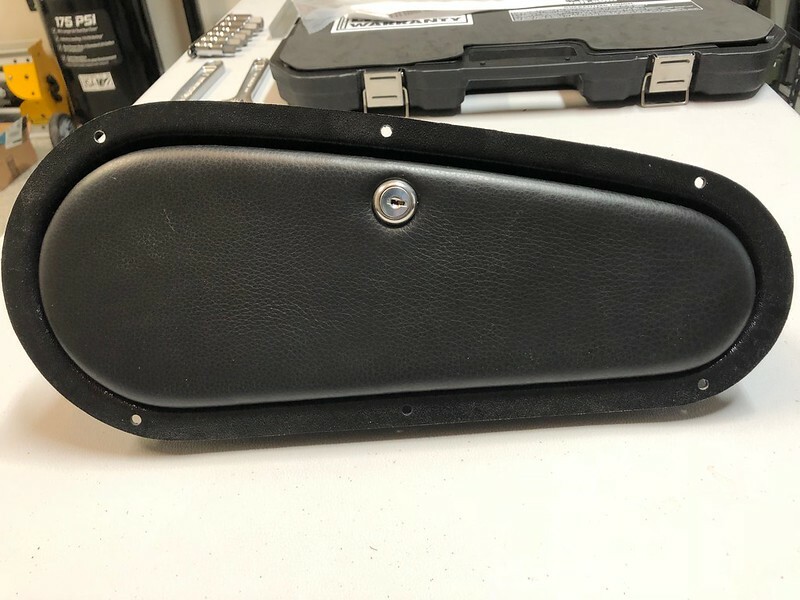 I decided to cut out this inner sleeve using a 1 1/4" hole saw to give a bit more volume inside for carbon and to make it easy to place a piece of Scotch Brite pad in the cover. Here is the finished product after I cut and placed a piece of Scotch Brite pad into each end and filled it with carbon pellets. It has a 1 1/4" diameter and is about 5 1/4" long. 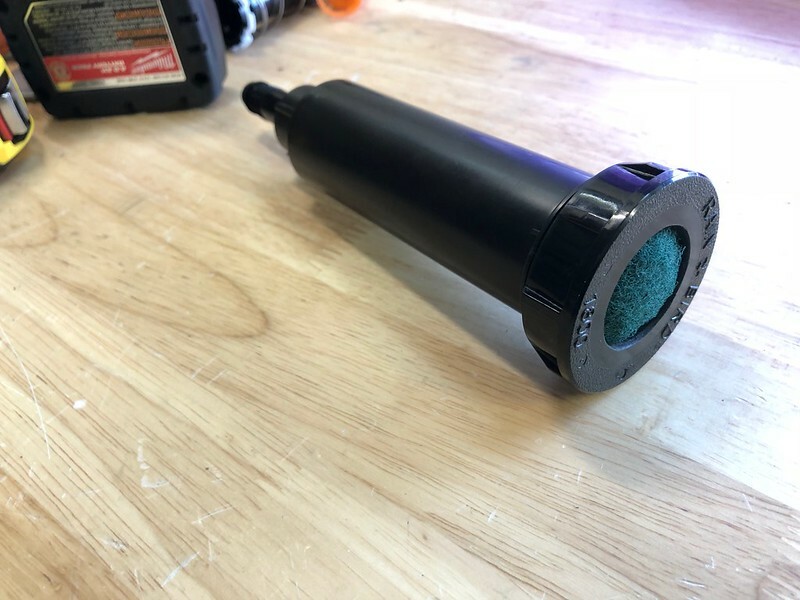 It probably doesn't have as much volume as some of the other solutions I've seen, but it's very cheap and it has a nice screw on cap and fitting so will be easy to change out the carbon if I ever need to. Now I just need to find a good location and clever way to mount it. 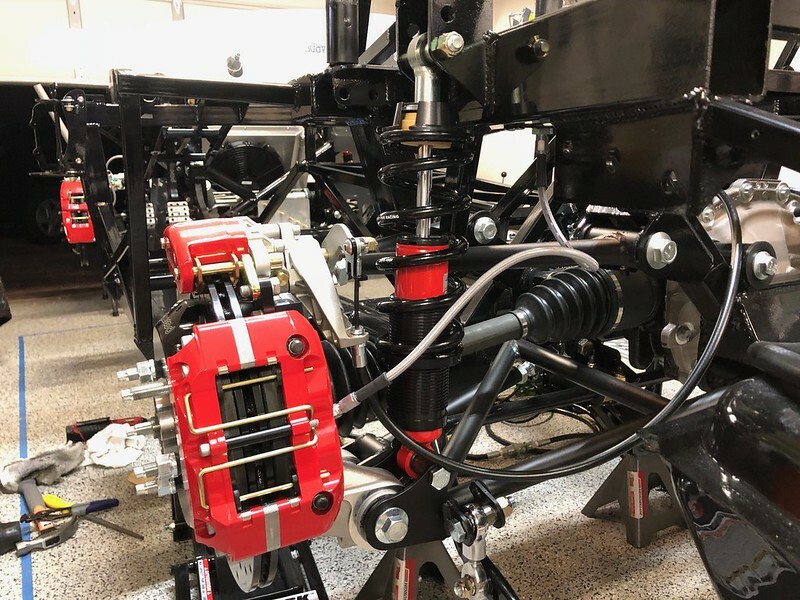 I started to mock up the steering shaft and I had a heck of a time getting it on. 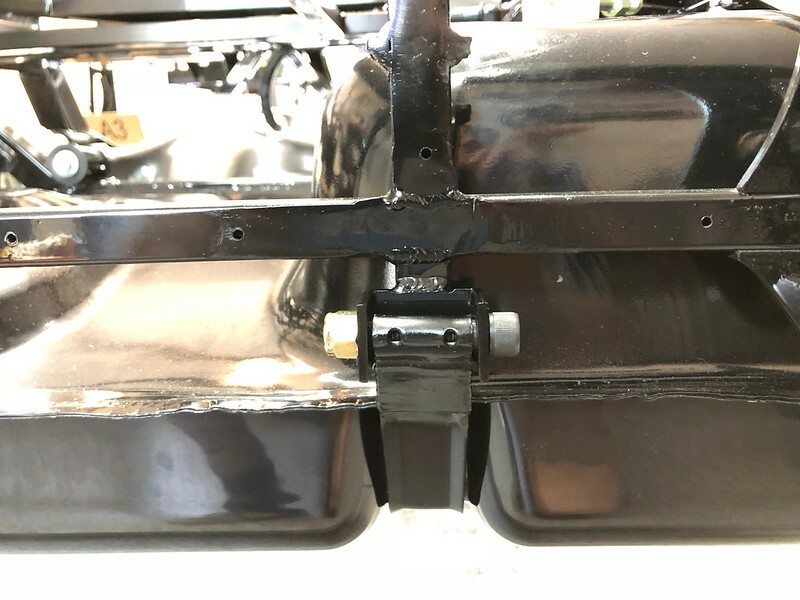 At first I tried to put the bearing that goes on the front of the footbox on the inside, but because of the bracket for the pedal box, it won't sit flush. 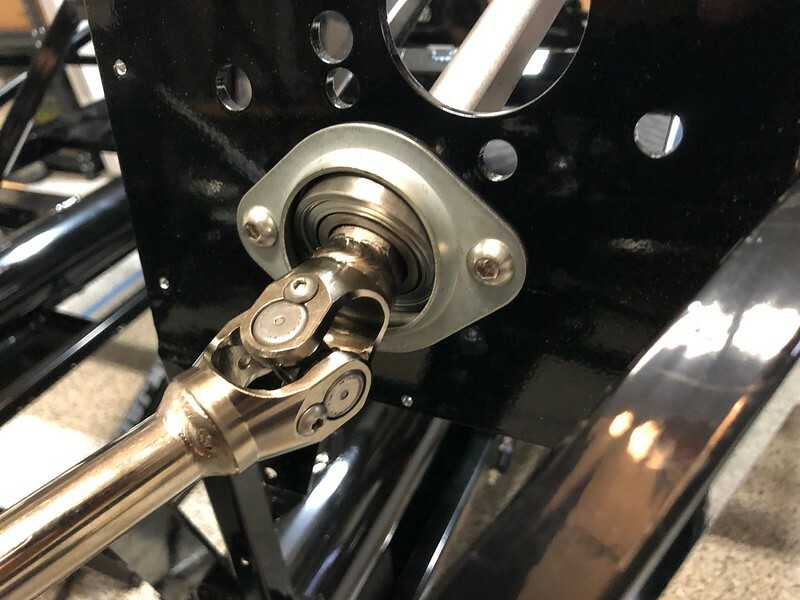 When I tried to put it on the outside of the pedelbox, there was so little clearance between that U-Joint and the bearing that I could barely get the other end of the shaft onto the steering rack. I mean the only way I could get it on was to rotate the shaft a bit so that the flats were at 12 and 6 o'clock and then I could barely get it to go in. 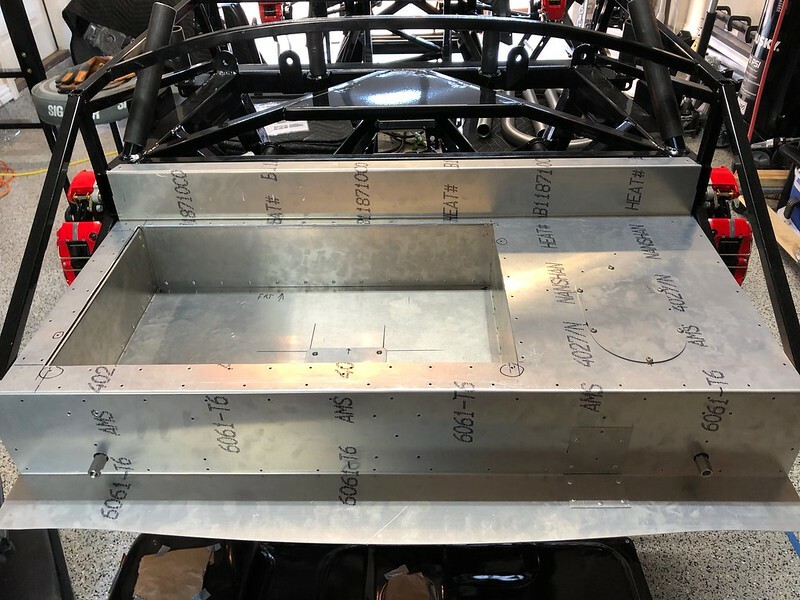 I fear that once I have the aluminum panel on the front of the footbox that I won't be able to get it in at all. I mean it is already so tight that it seems like 1mm would make a world of difference. Anybody else run into this or am I doing something wrong? 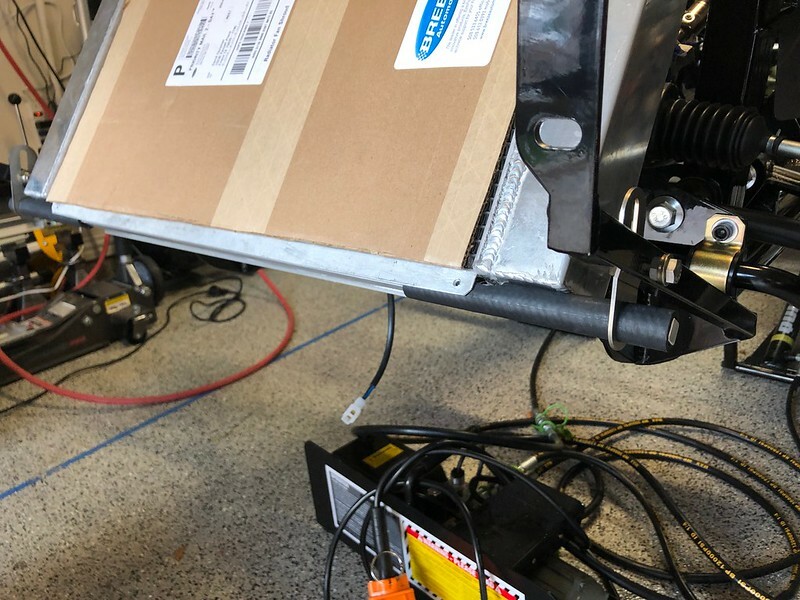 My first thought was to mark where the interference is on the pedal box bracket and cut that bit of metal off of it so I could put the bearing on the inside, but that seems a bit extreme. I worked on a few different tasks this weekend. I put together my flexible fuel lines and got my regulator installed. I am going with the LS style fixed regulator and I installed it close to the fuel tank. 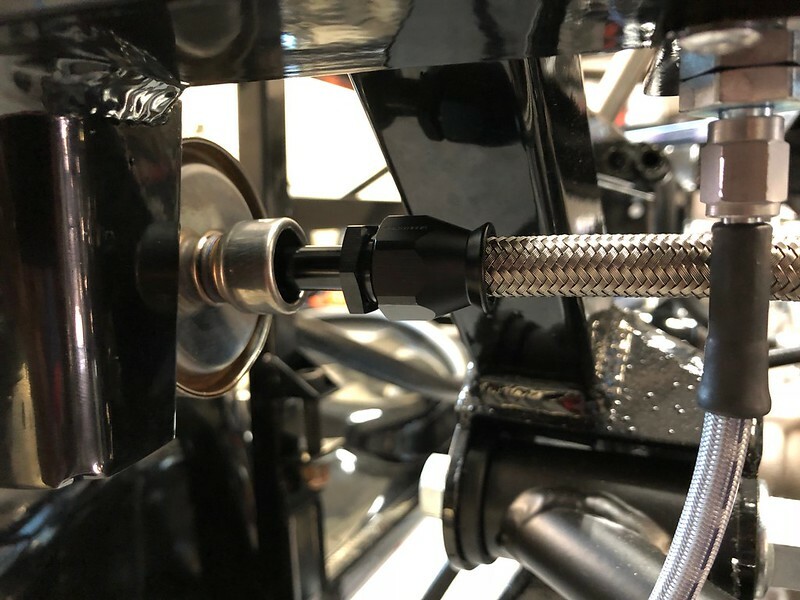 I am using stainless braided PTFE hose and mostly Quick Detach fittings from Racetronix. The price was pretty good on these fittings and I like the idea of a single fitting instead of QD to AN fittings. 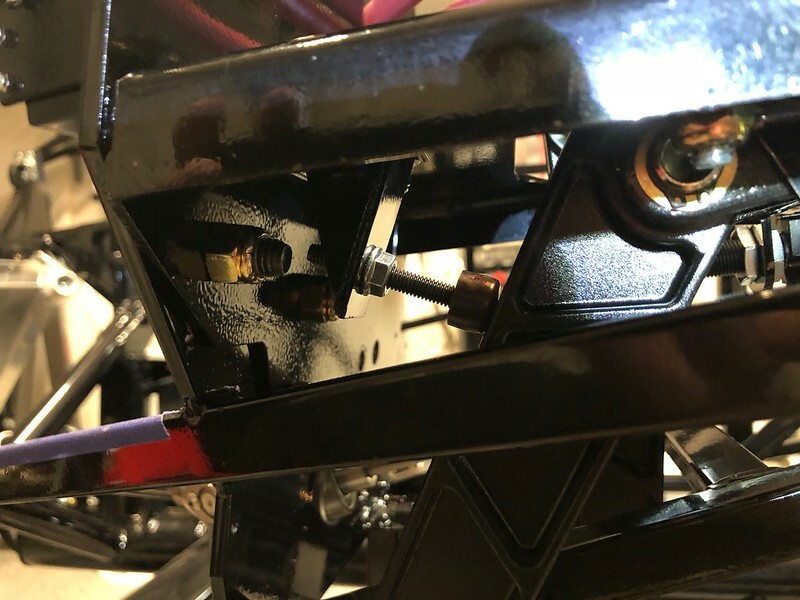 The fittings to the M-Pro hanger are AN, also from Racetronix. I am going to run a single Nicopp 3/8" line to the front for the engine. 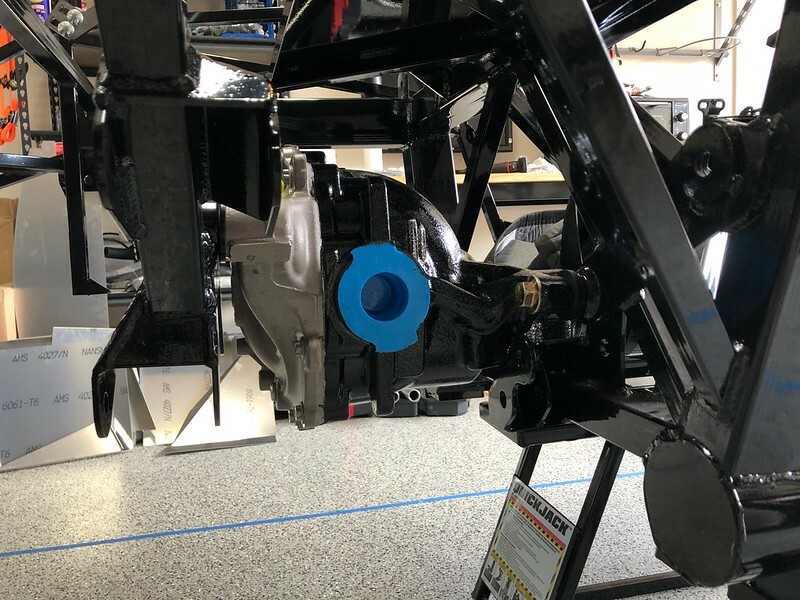 I also installed the new pulley and power steering pump w/reservoir on the front of the Coyote. 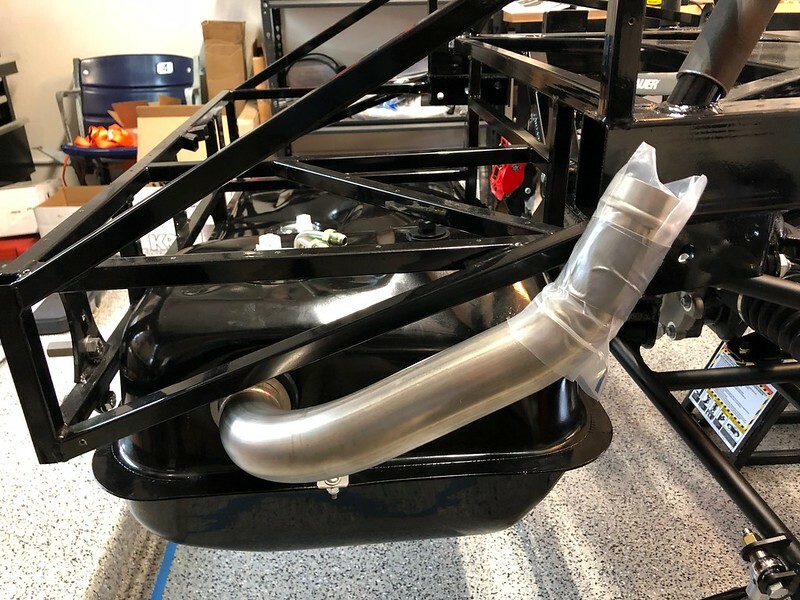 Next up is the radiator. 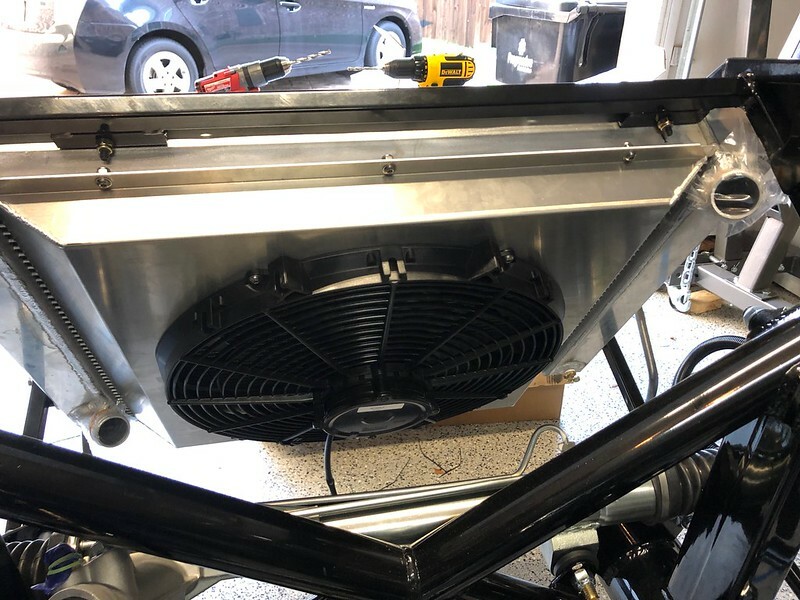 I installed the Breeze fan shroud and mounted the radiator with the Breeze lower radiator mount. I'm going to pull it back out and send the fan shroud out to be powder-coated with my next batch of panels. 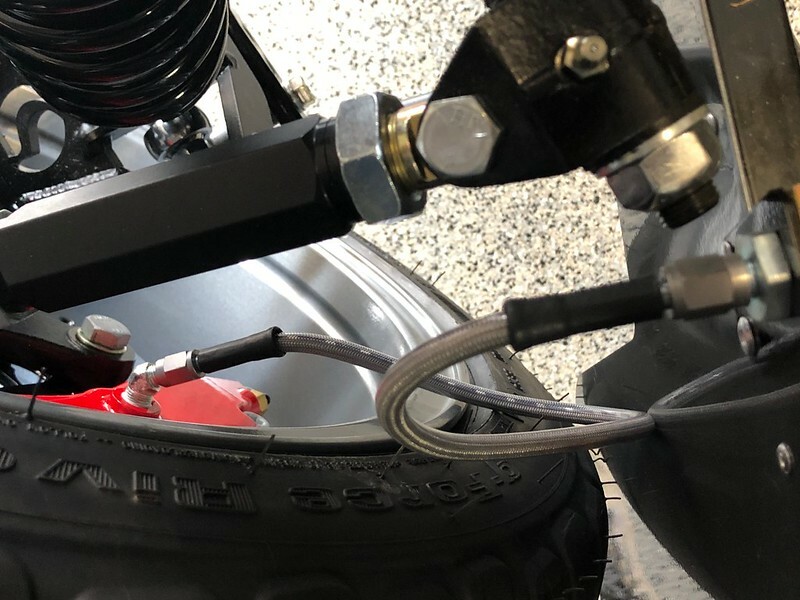 I installed my flexible brake lines front and rear. I guess my next major project is going to be to run the hard lines for brakes and fuel. Another job I have never done before, but I'm looking forward to it. 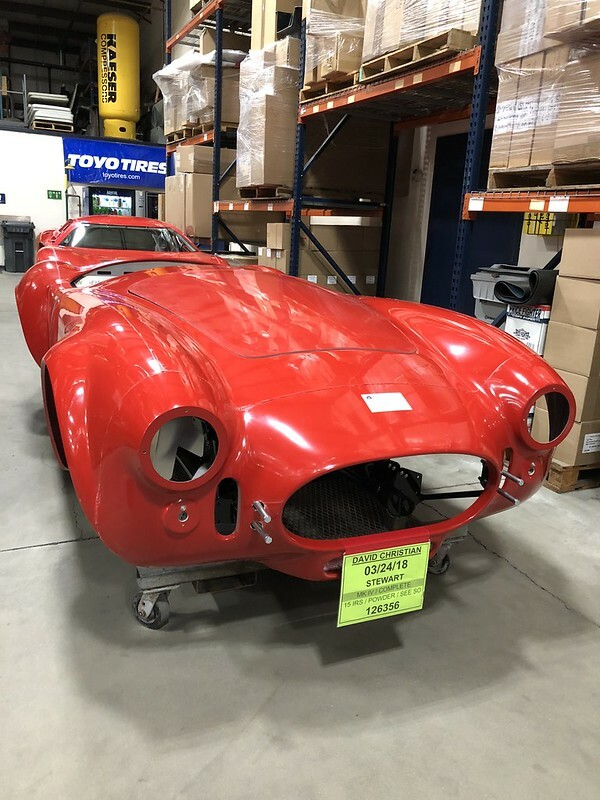 Last edited by shark92651; 06-11-2018 at 05:41 PM. 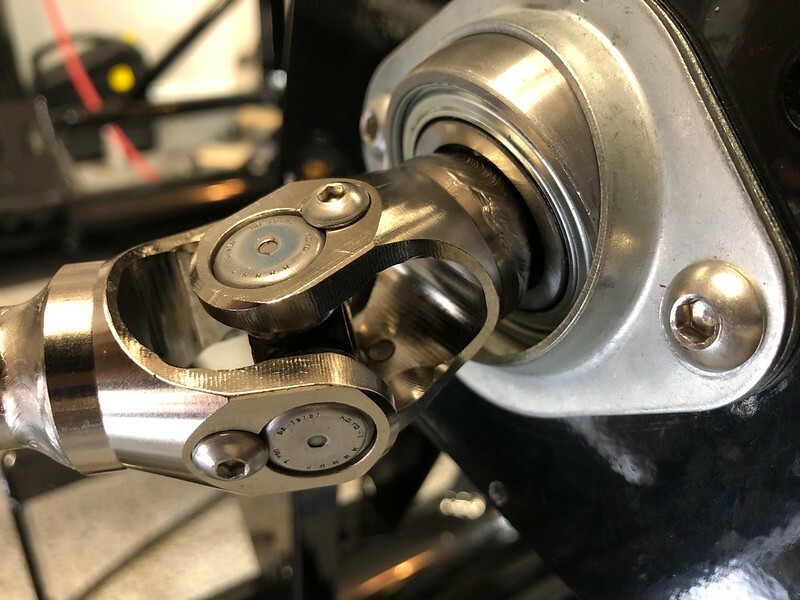 The Tilton Hydraulic Release Bearing requires a clutch stop to prevent excessive movement beyond what is required to release the pressure plate from the friction plate, only 1/4" of additional movement of clutch pedal once released. 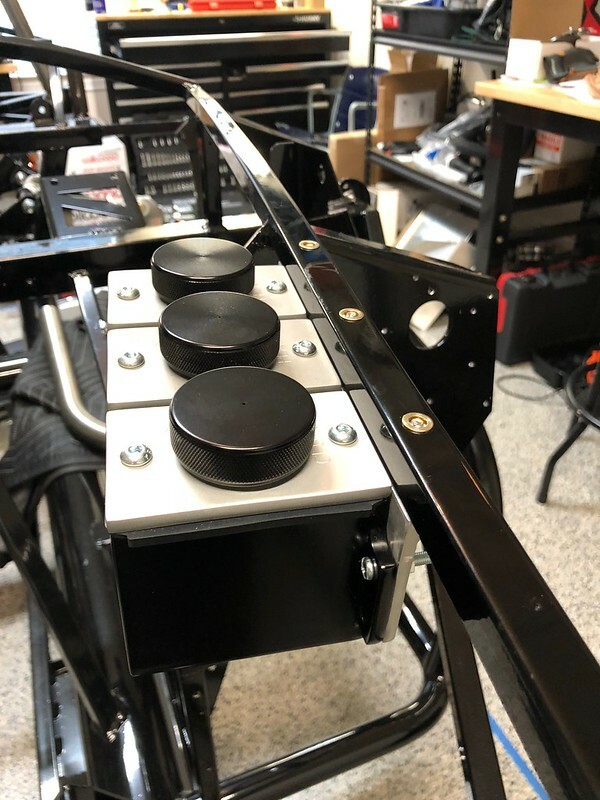 I came up with a design for a clutch stop and will mount it on the underside of the top pedal box bracket in the general area where the FFR supplied clutch stop is located. 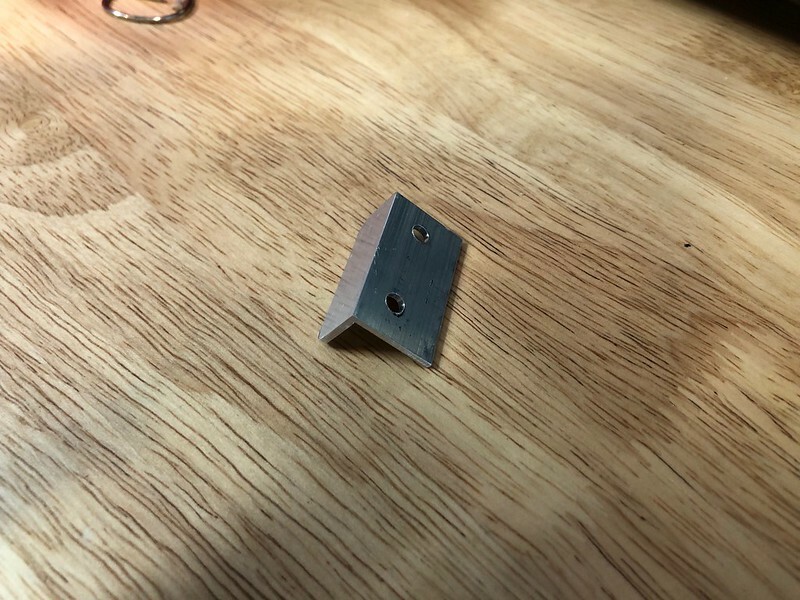 It did require an additional hole drilled into the bracket so glad I did this now before I plumb everything, because I had to pull it all out in order to get to the area I need to drill. Here is what I came up with. 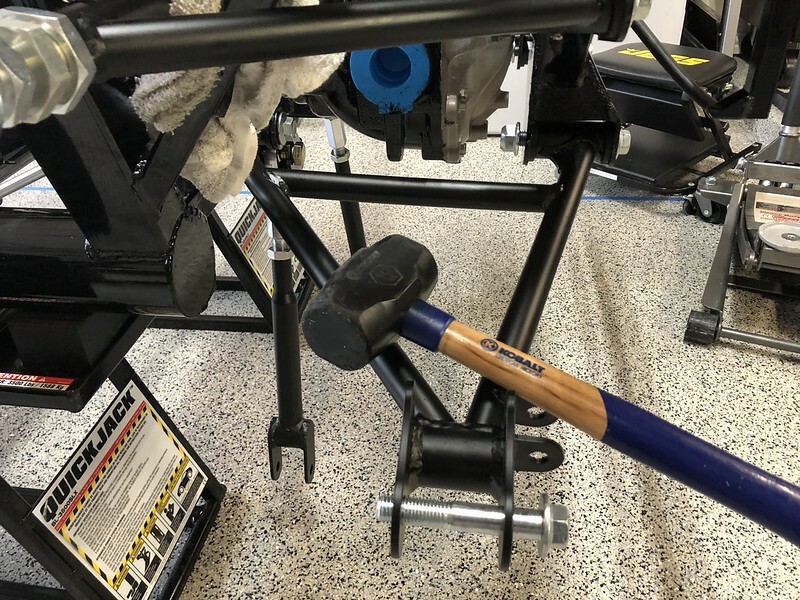 I angled the bracket so that the clutch stop engages with the pedal at a roughly 90 degree angle. 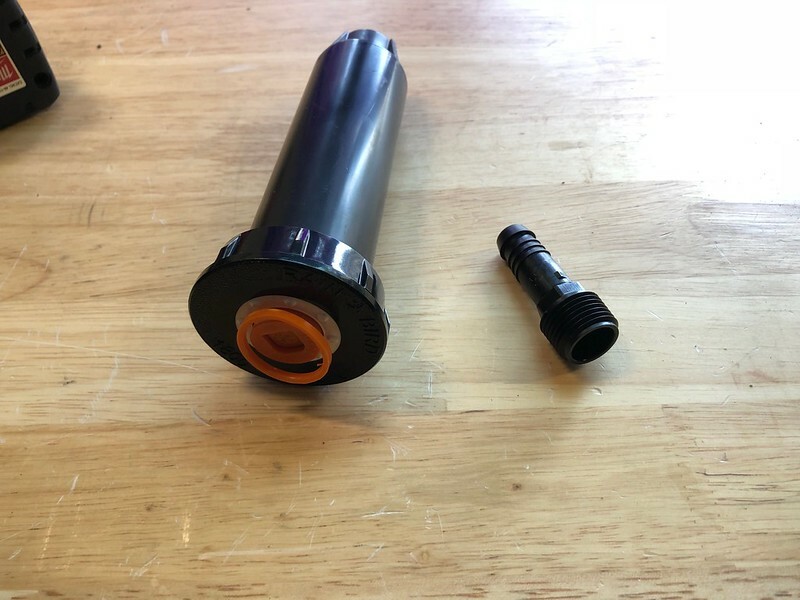 The adjustable bolt with plastic cap actually came off a hinge door stop from Home Depot. 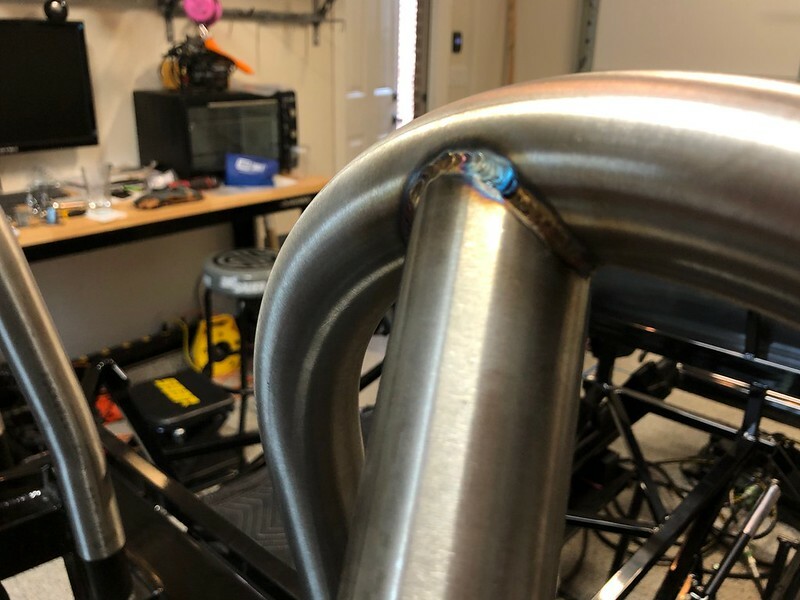 I had my friend come over to do some more welding for me at lunch yesterday to put the two pieces together. I also had him weld up my dual stainless roll bars from Breeze. I think they turned out pretty nice. 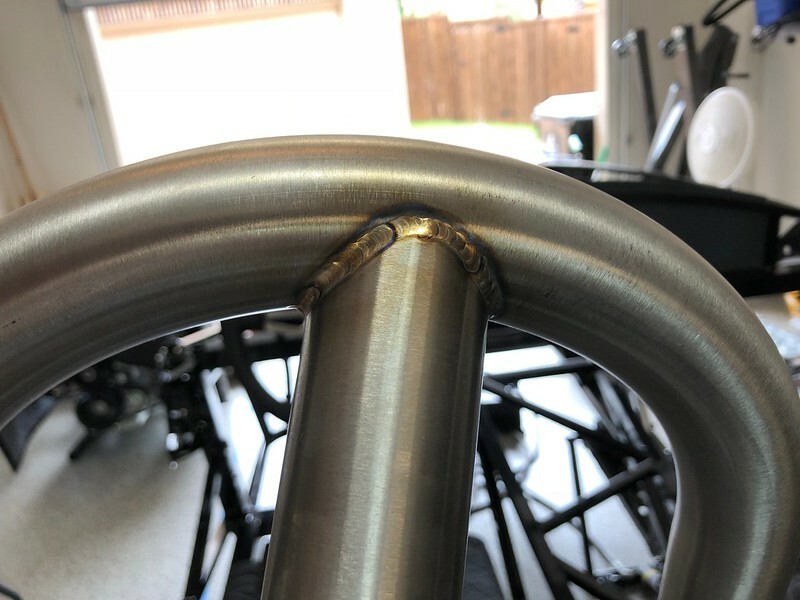 I hope the discoloration around the weld will polish out when I have the bars polished, but I really don't have any experience with this so don't know. 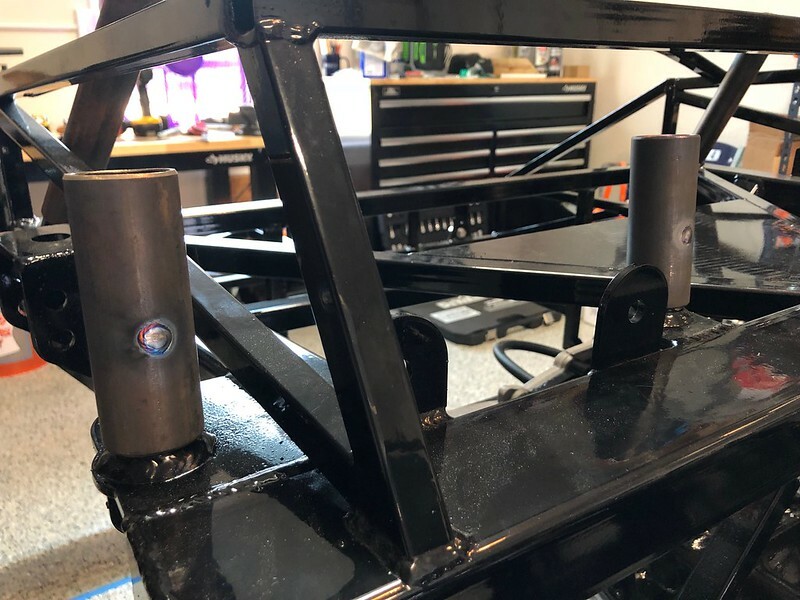 I also drilled holes in the short stub tubes for the hoops and had my friend plug-weld those to the MK4 chassis stub tubes so I have one less set of holes to drill and through-bolt. The DS rear leg snugged up really well with the hoop but the PS was a bit off, by about 1/2". I had to make one cut in the stub tube to bend it a bit to get perfect alignment. 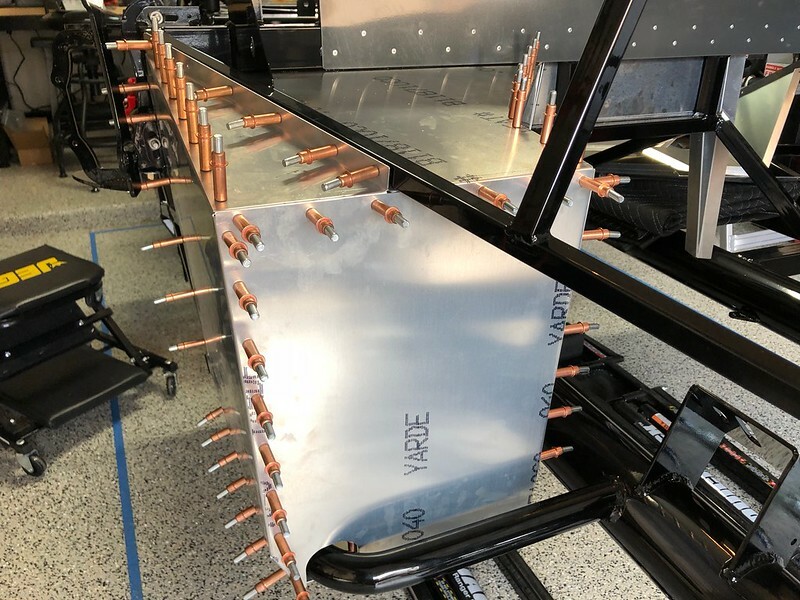 I will have my friend weld up that cut when I am closer to mounting the body. 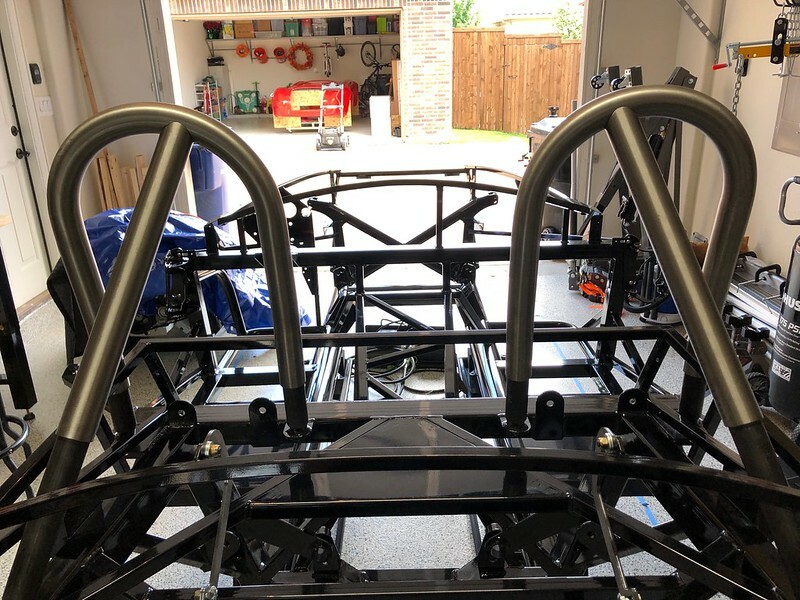 I greased up the stub tubes and inside of the roll bars pretty well before I tapped them into place and he welded them right on the vehicle so there should have been very little movement. Hopefully they will pull off fairly easily. 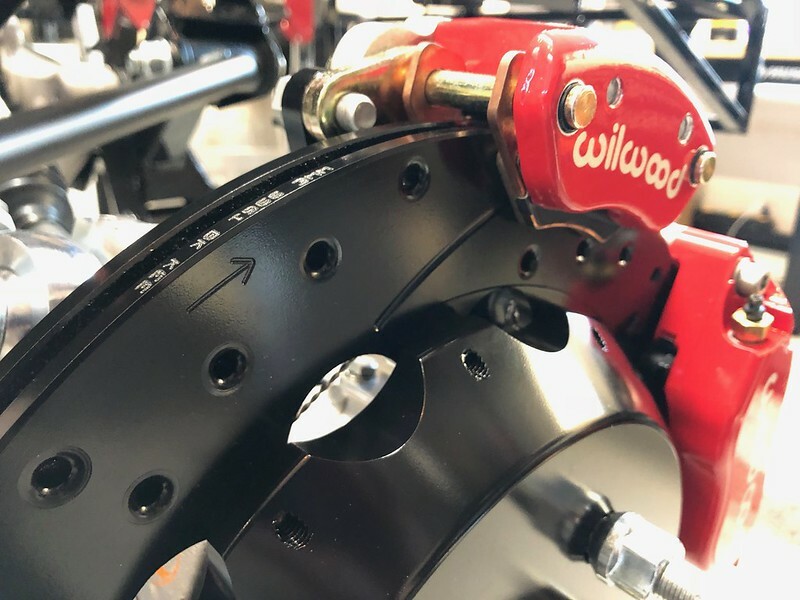 I powder coated my clutch stop and installed it. It works pretty well. Currently I have it adjusted to stop the clutch just before contact with the frame tube. 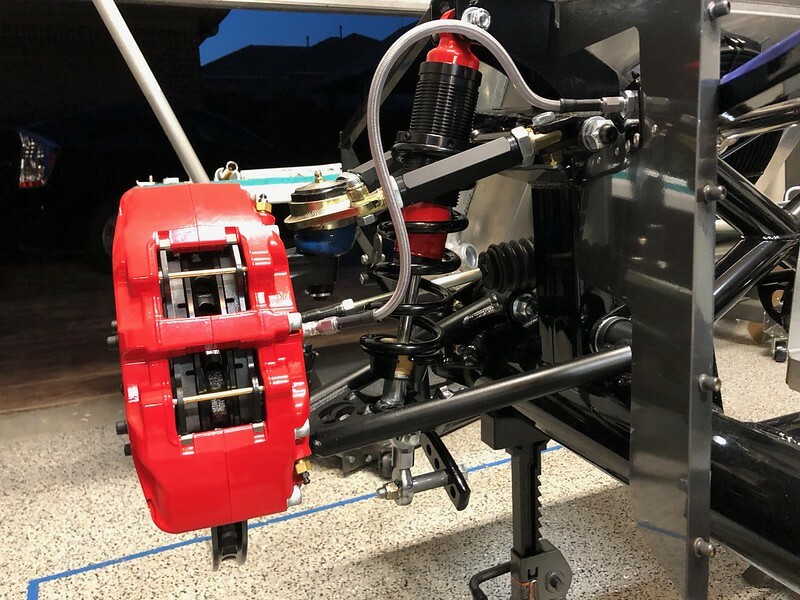 With a little bit of modification I was able to get the Coyote bottom travel clutch switch working with my hydraulic clutch setup using the brackets that FFR supplies. 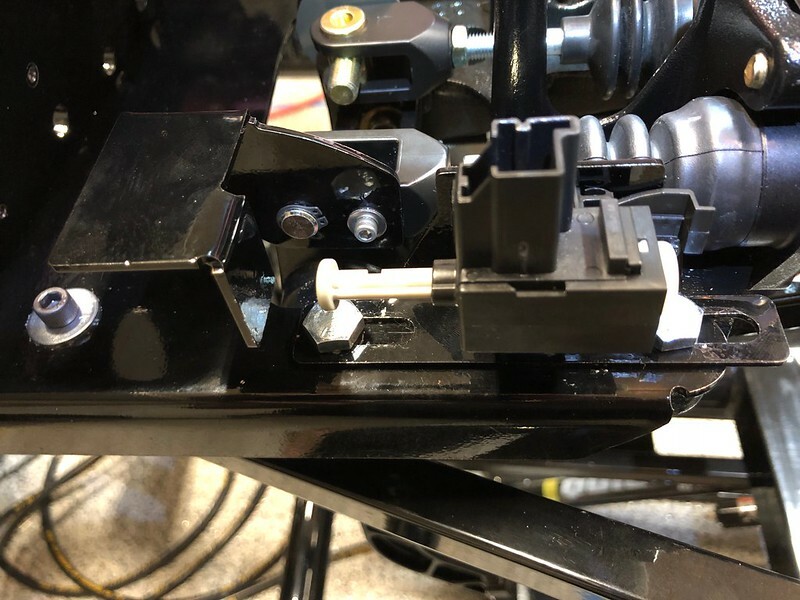 I took the switch contact bracket for the cable clutch and trimmed it down a bit and then I drilled and tapped the clevis on the end of the clutch pedal so that I could attach the bracket to the clevis with a single 6-32 bolt. I was able to attach it with the existing pin and snap rings. Last edited by shark92651; 06-15-2018 at 12:20 PM. Your pictures and descriptions are well done. Following along since I am right behind you in progress. I have received far more information on this forum than I can contribute, so it's good to give back. I'm glad some people can gain something from my posts. Last edited by shark92651; 06-18-2018 at 02:42 AM. 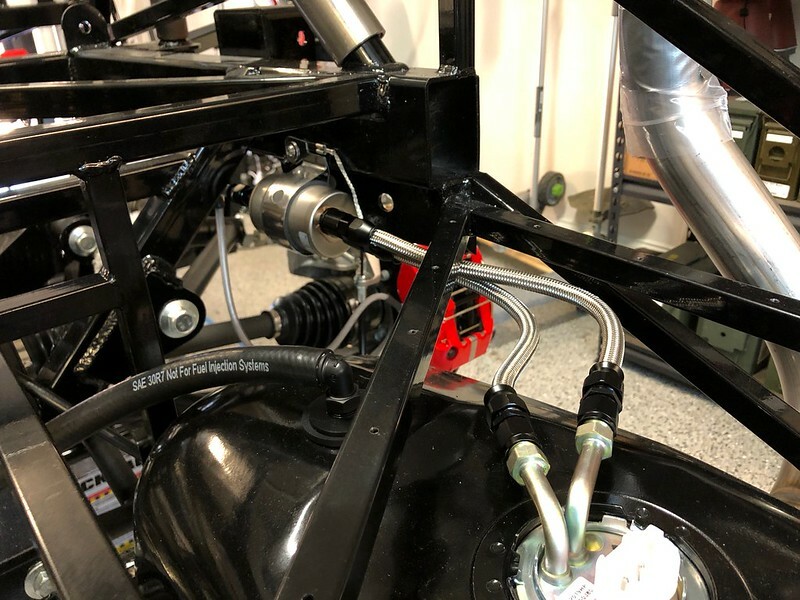 Well my back-ordered shocks finally arrived and I got them assembled and installed, and attached my front sway bar. 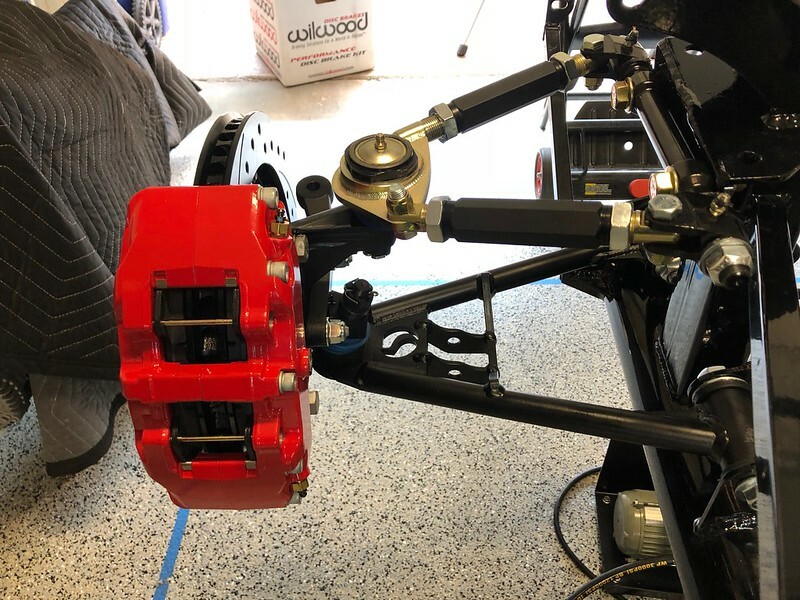 I wanted to get it on the ground so that I could tighten up the axle nuts and the drive shaft adapter, so I re-installed the e-brake. 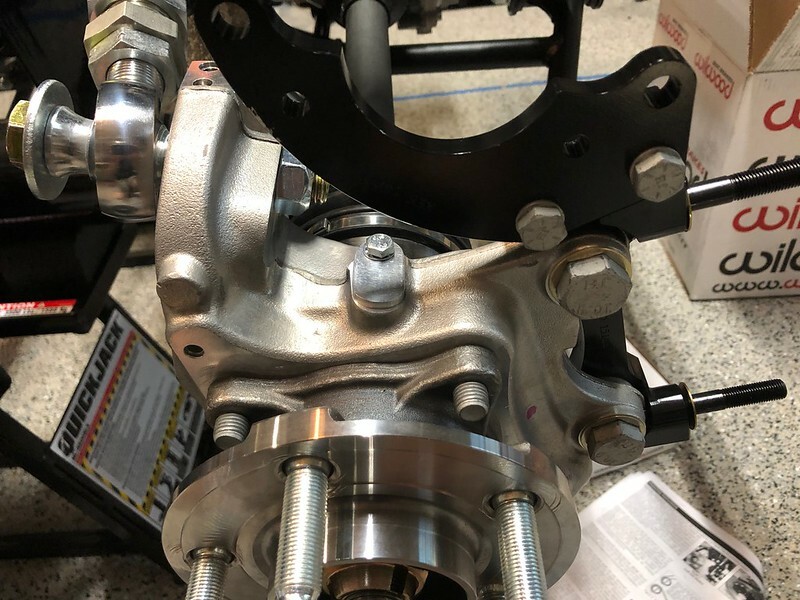 For some reason I had a heck of a time getting the e-brake re-installed. I ended up removing the cables from the calipers in order to get enough slack to reattach everything. 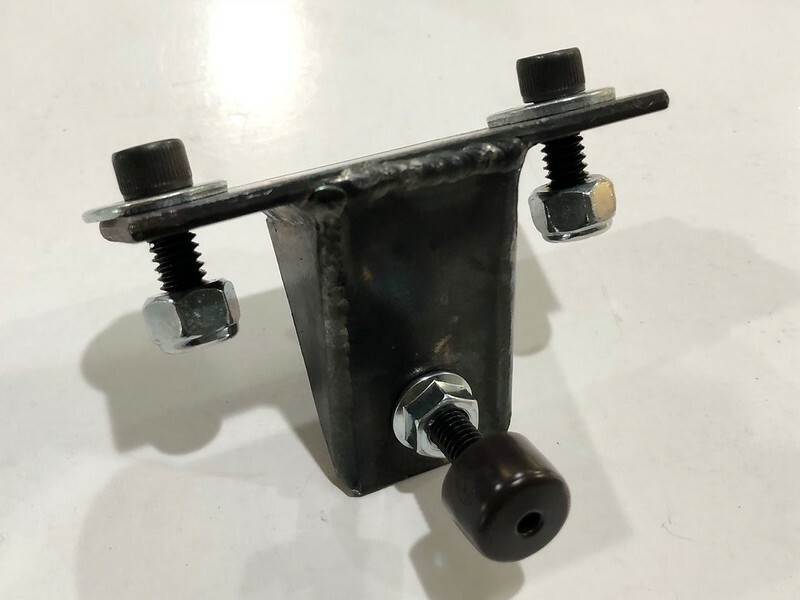 One quick note that may be useful to someone: I had to cut the corners off of my front sway bar brackets in order to get them to seat flat - there was contact with a weld that was bending them. Here is a shot looking down at the front-left tire with the steering almost all the way to the left. If I turn it a bit more the tire will rub the F-Panel. 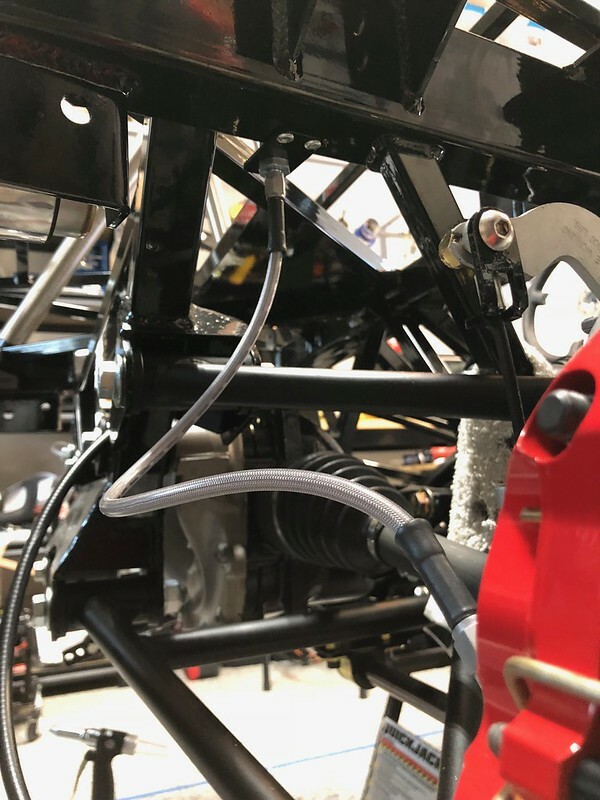 Also note the contact with the flex brake line. 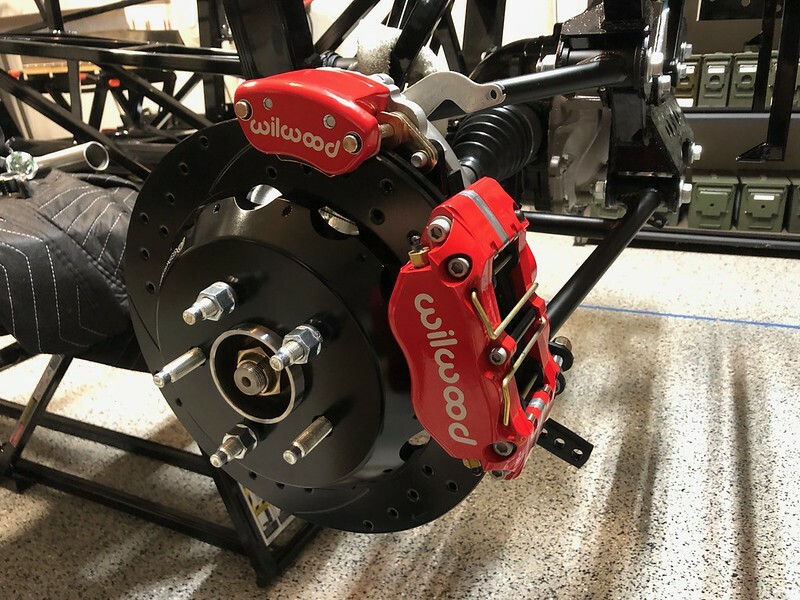 These Wilwood brake fittings are a 45 degree and right now they are angled towards the tire. 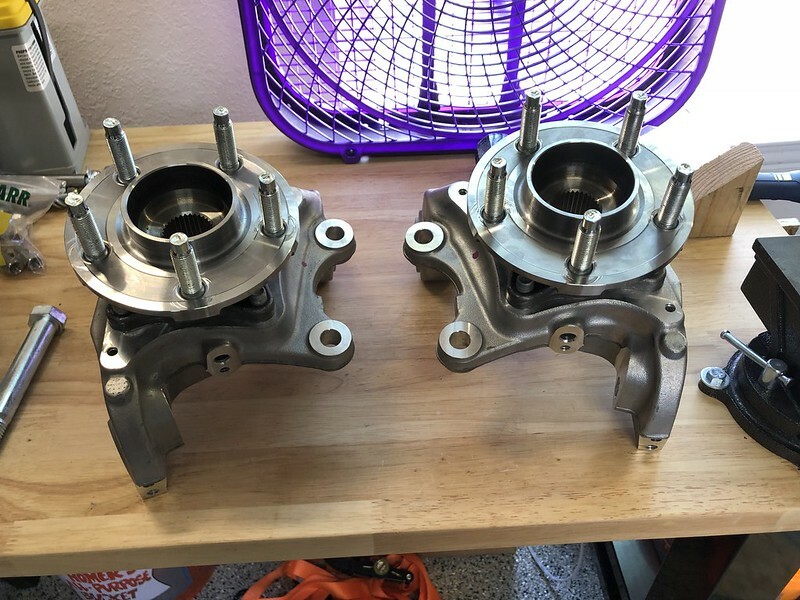 Should I re-seat these and angle them more towards the hubs or vertically? 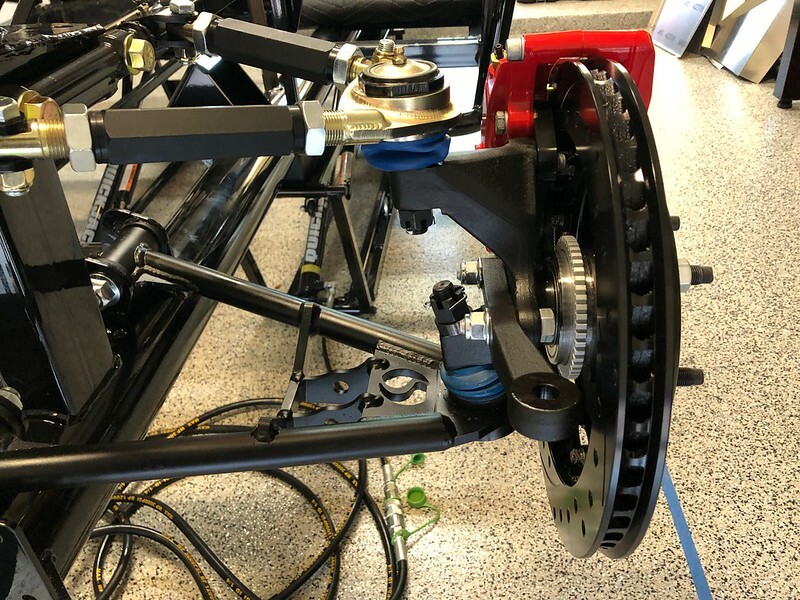 Also I guess I can re-attach the flex lines and have them more bowed in towards the shocks. Any other suggestions? Also, how can I prevent contact with the F-Panels?